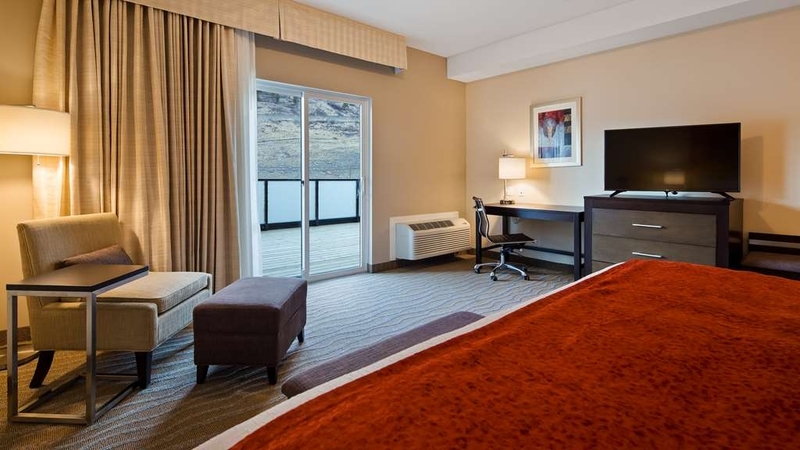 The Best Western Plus Merritt Hotel is ideally located in the center of Merritt. Come and experience our hotel near the major tourist attractions. Best price guaranteed and exclusive deals. 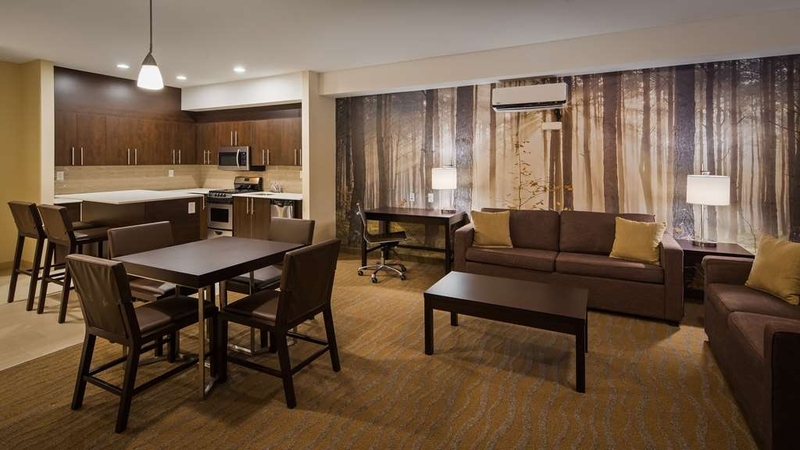 The brand new 83 room Best Western Plus Merritt Hotel is Merritts' newest, largest and most modern facility. 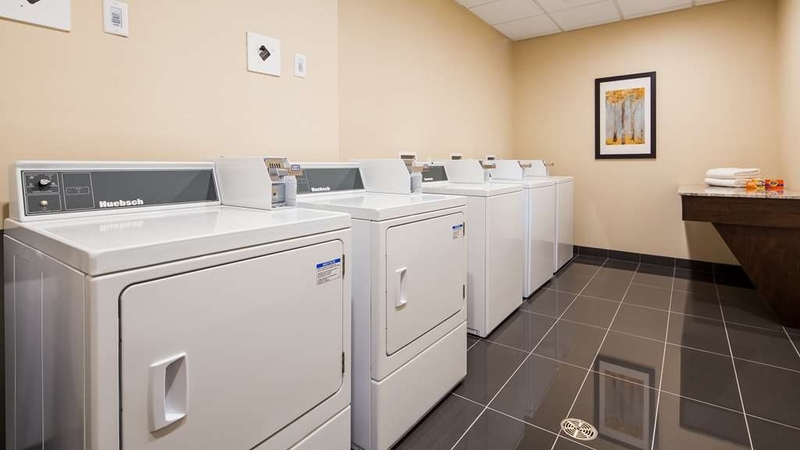 Complimentary full breakfast, fitness center, guest laundry, business center and a meeting room for up to 65 people. Tesla stations are available to charge up your electric car. Large parking area is provided for buses or larger vehicles. All rooms have high-speed wireless internet, hardwired Internet, 43-inch LED televisions with On Demand movies and single serve coffee and tea maker. With a wide variety of restaurants and lounges located nearby, our guests never have to go far for a good meal. Please contact hotel for availability of pet friendly rooms. What a beautiful hotel! From the moment we arrived to the moment we left it was a wonderful time. The front desk staff was super nice and helpful, our room was fairly cheap but one of the most comfortable beds I have slept in. The hotel is newer I think the front desk man said it open in August of 2017. Pool and hot tub were both fairly large, and we were the only ones in there so it was perfect! The only negative sides of this hotel are the pool was quite salty but that's not really a big deal. Also, for the continental breakfast they had like no fruit. Mostly just rotten oranges and quite Brown bananas. Plus sides are super cheap, comfortable bed, can't hear the highway from your room, free coffee and tea all day, newer facility so very very clean and they have a concession 24-hours up front in case you forgot anything. 10 out of 10 would stay here again! We arrived in Merritt after a long, LONG, day of driving from Edmonton. We were exhausted! We had an absolutely amazing room with two separate bedrooms and a pull out sofa in the living room. 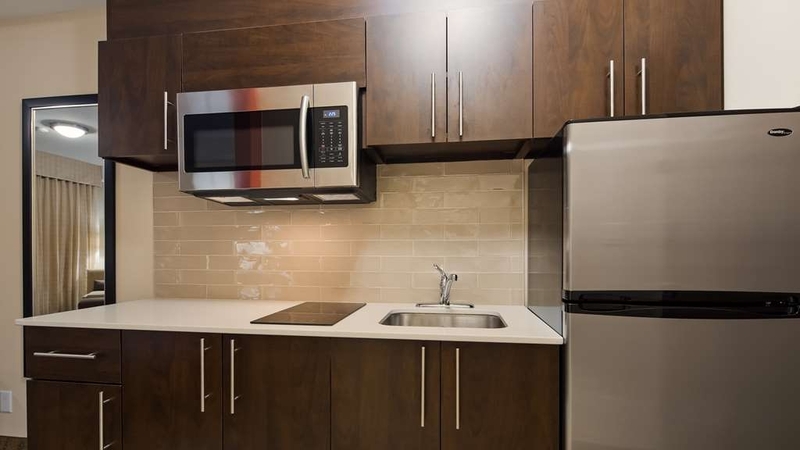 The entire unit was absolutely huge with a gorgeous kitchen and oh so very clean! This is exactly what we needed after a full day crammed into the car with five people....a huge, clean room where we could just unwind and have some time apart! Each bedroom had a tv, as did the living room....talk about convenience! With the free full breakfast, huge room, cleanliness and friendly staff, this will definitely be our regular stopover point when driving the long drive from Edmonton to the coast! We would highly recommend the Merritt Best Western Plus. Great location, great rooms at a reasonable cost plus you get a free hot breakfast. Enjoy a free latte or mocha at any time in the hotel lobby! Thank you for your review and recommendation! Your compliments provide encouragement for staff and management to continue giving our guests unique and superior stays time and time again. See you soon! "Another great Best Western stay"
We stayed here for one night on our way back to Vancouver. The hotel is very nice, very clean and organized. Our room was immaculately clean, comfy bed, nice linens and breakfast was included. The WiFi is exceptionally good. One of the front desk staff gave us directions to Nicola Lake and advice about where we wanted to go for dinner - very friendly and helpful. We had a King room and my only comment would be that given this is most likely for two people it would be great to have two comfy chairs in the room instead of just one for watching television etc. That is a minor issue though and I would definitely stay here again if in Merritt. Second time staying at this hotel. Clean rooms, comfy bed, and pool was great for the grandchildren. Staff (especially Sam) were very accommodating and helpful. Would definitely stay again. The only nehative thing is they don't have debit machine yet, so had to find a babk machine to get cash, but they said they will be getting debit soon. Thank you for your review and repeat business! Great to hear our ameneties have made your stay enjoyable. We are working to correct the debit machine issue and will have it solved as soon as possible. See you soon. The Best Western Merritt was a great place to stay, very clean and comfortable with some good restaurants near by to choose from. The staff are very friendly and accommodating. Traveling for business is a need for many and this hotel make you feel at ease. Thank you for your review! 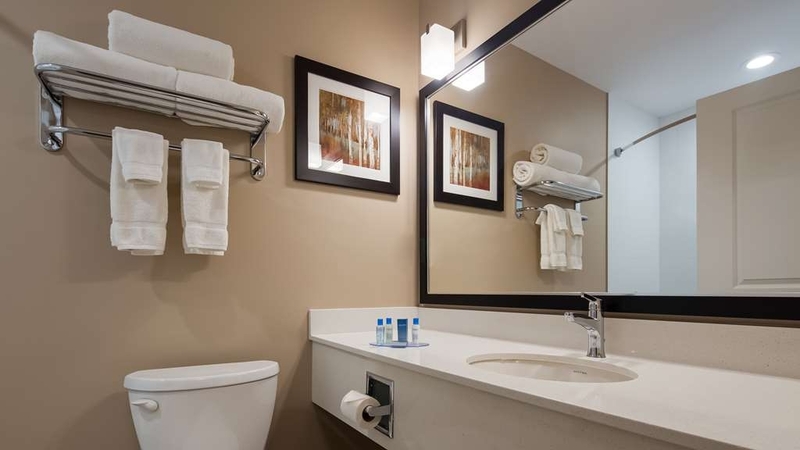 Whether you are on business or leisure, Best Western Plus Merritt Hotel is the ideal stop for all travellers. We look forward to seeing you again! Thank you for your review. Our goal is to provide the guest with a great Best Western experience from check in to check out. We are glad we could achieve what we set out to do! We look forward to seeing again! We had a great stay here on our way north for Christmas. Clean, comfortable and friendly. I would definitely stay here again. We liked it so much we stayed here again on our return. They provided information on restaurants and other things to do in the area. Thank you for your review. 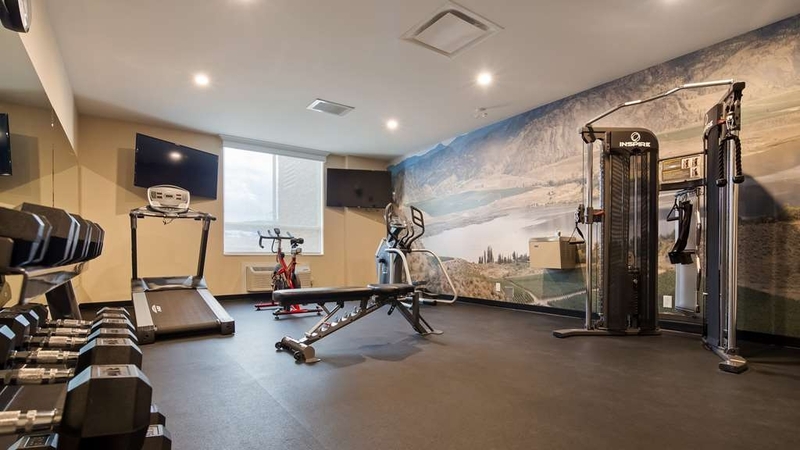 While we have guests enjoying our accommodations we believe it is our responsibility to make you aware of any local attractions or restaurants that will make your visit to Merritt memorable. Thank you for becoming a loyal Best Western customer. See you soon! We have stayed the the Merritt Best Western whenever travelling to and from Vancouver Island. The room are clean, hot pool and gymn were allowed for relaxation after a long road trip. The breakfast time 6 AM allows for an early start on the next leg of our journey. Thank you for the review. Repeat guests such as yourself speak volumes to the quality of product our guests are recieving! A restful break and convenient hours on all ameneties allow you to set your own schedule instead of adhereing to one. Thank you for staying with us and we look forward to your next stay! Due to a childs hockey tournament a nice hotel turned bad. Zero sleep possible due to kids playing hockey in the hall ways and on tile floors outside of the elevators! Staff really did nothing, very disappointing and a large waste of money. Thank you for your review. I do feel apologetic for the hockey teams disturbing your sleep. I have reviewed the situation with all employees on shift during your stay. I would love to review your stay offline and make it right for you. Best Western Plus Merritt Hotel takes pride in providing a great stay for all our guests. I look forward to hearing from you. Thanks! The hotel appeared to be relatively new so everything was on great condition. The beds were very comfortable. Breakfast was good and the relaxing. The water pressure was a bit week for it took a long time to fill the tub. Thank you for your response. We are a new hotel and take pride in being able to provide our customers with quality accommodations. See you on your next trip through! A great hotel, new, clean, well maintained. Friendly staff, great value. They give people with dogs a dog treat bag, something my little dog loves. They have a fitness centre, pool and hot tub. Excellent parking, close to restaurants. Always excellent value. We got 4 rooms since we were in town for a family reunion/birthday party - last minute room changes and room moves were not a problem. Nice rooms and very good breakfast - we were all pleased with the hotel. I recommend this place. Thank you for your review. Being in the hospitality industry we will always try to accomodate our guests' requests. We are glad you enjoyed your stay and your time in Merritt, see you on your next visit! Thank you for the review. Whether it be just an overnight stop or a weekend in Merritt it is our pleasure to accommodate our guests and give them a great experience. See you soon! We found this hotel to be clean and very friendly! Our hockey stayed here for 2 nights and enjoyed it very much! The complementary breakfast was very well done with eggs, sausage, cereals, juice, muffins, waffles and much more! The hotel staff was super friendly! 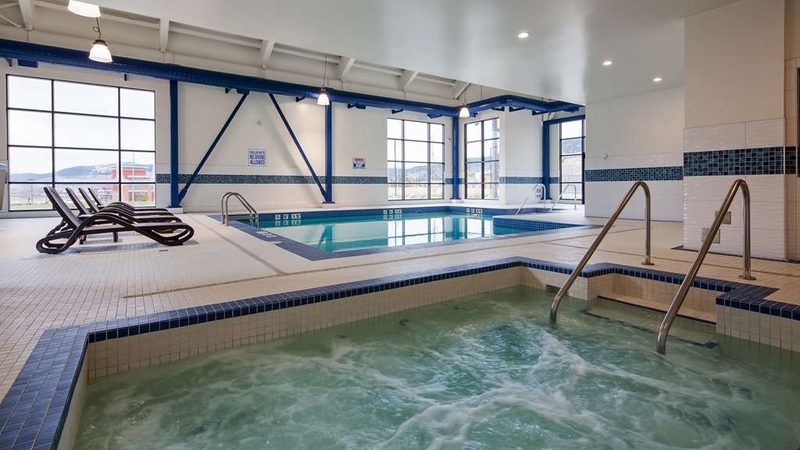 Our team enjoyed the use of the pool, hot tub and banquet room! We also found the location very convenient! I would recommend this hotel! Thank you for your review. With our open layout and spacious public areas accommodating teams or larger groups are a breeze. Our staff in all departments continue to work hard making all experiences positive! See you next time. This is a beautiful hotel. You can see they go that extra mile for cleanliness. Super friendly staff. Rooms were extremely modern and clean. The breakfast room was large, open and again super clean. Definetly a spot to stay at on my travels. Modern, clean and comfy rooms and a pretty decent breakfast. It's a bit of a remote location, but I'm guessing that most people arrive in Merritt by car. Probably the best place for dinner is the pub across the highway. The hot tub and pool looked so inviting that I went to Walmart down the block to buy a bathing suit, since i forgot to pack one. 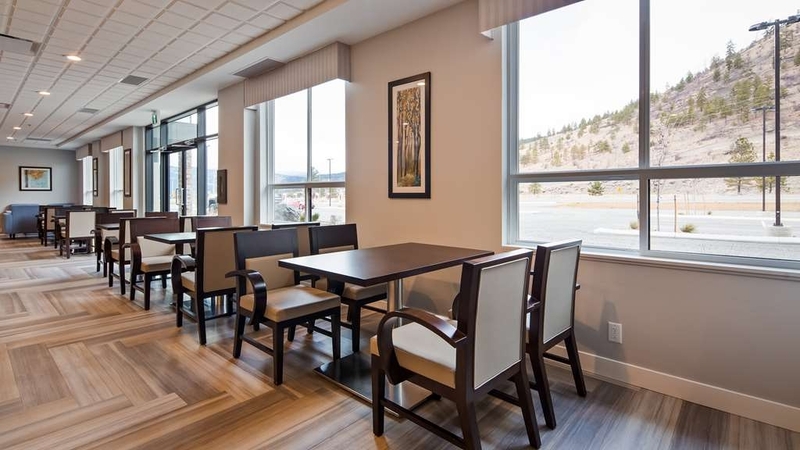 This is a beautiful, modern, clean (shining actually) hotel conveniently located just off the highway in Merritt. Parking via either door is above ground, close and well lit (great for women travellers). We have stayed at this hotel a number of times and all of the staff are not only welcoming, friendly and professional, but go the extra mile to ensure your stay is pleasant. The hotel offers coffee and tea in the lobby; and a full breakfast buffet. Wifi is strong and reliable, rooms comfortable, clean and quiet. On our most recent visit we had the opportunity to attend a meeting in their meeting room, so very accommodating for business travel. Check out was also fast and efficient, and prices very competitive. This hotel offers excellent value and I would highly recommend it for business or family travel. Our first impression when we walked into this BW in Merritt was how clean it was. The tiles were literally gleaming. That same standard was throughout the hotel. The staff were very friendly and helpful. The coffee machine in the lobby offered amazing choices. The breakfast was a nice end to a great stay. Great people to deal with on the phone, thanks Anoop and Danika with reservations. 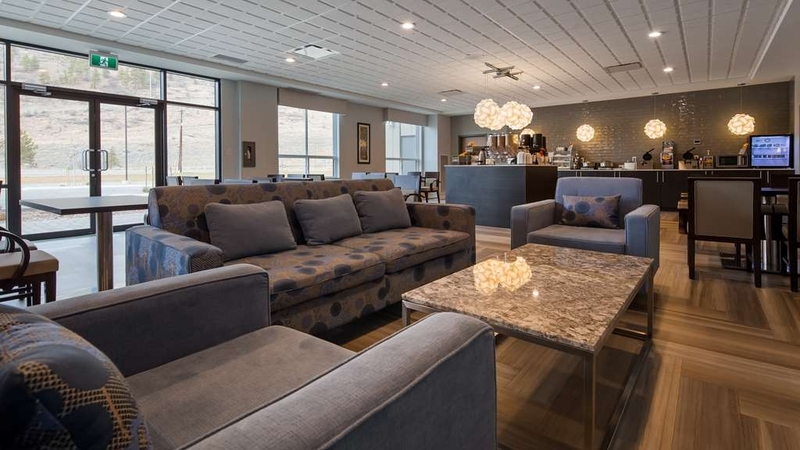 Well designed hotel, very welcoming lobby and breakfast room, lots of parking, Boston Pizza across the street, 5 minutes from downtown curling rink and jockey arena. Full hot breakfast perfect for sports teams or long stays. Friendly staff and brand new and clean rooms and amenities. Great shower water pressure. High recommend, will definitely be back when staying in Merritt. Thanks for the great review! We are always more than happy to help you find the best rates and rooms during your stay in Merritt. With our spacious breakfast room we are able to handle teams and groups with ease. Guest comfort is always our foremost concern and we will continue to work day and night to achieve this. We thank you for the recommendation and look forward to seeing you on your next trip! "Best Place To Stay In Merritt"
Very comfortable rooms, friendliest and most hospitable staff i've ever encountered. stayed here for 11 days while in town for work. hot tub and pool were very clean and well maintained. Clean rooms and modern design. great value. lots of parking for rv's and semi truck/trailer combos. husky truck stop across the street (was closed for renos). easy access for commercial vehicles. Thank you for the great review! We are proud to offer a great location where you can park your over-sized vehicle and not have worry about being blocked in ever. With food and shopping within walking distance you can park once walk for anything you need. Thank you for choosing us - we look forward to accommodating you again soon! Big clean rooms, comfortable beds. Smaller bathroom but has a full size bathtub. The 24 hour gym was handy. Indoor Pool and spa looked big and clean. Breakfast was adequate with hot and cold buffet style. Walking distance to restaurants. Staff were friendly. The only complaint would be the noisy aircon in the bedrooms turning on and off all night. Thank you for your review. We are glad to hear you enjoyed your stay. Our beds have been a guest favorite since opening last year. We look forward to seeing you again soon. This is a fantastic hotel to stop at if you are passing through Meritt. 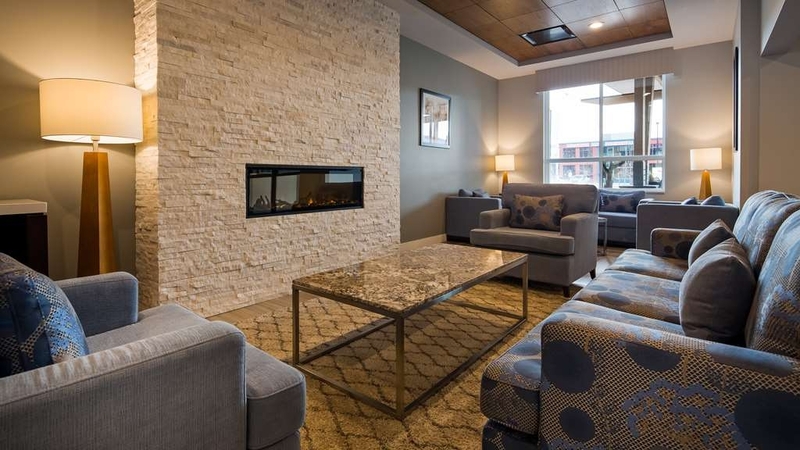 The lobby is really nice with lovely modern furniture, fireplace, and free tea and coffee. The staff are lovely and even gave our dog a bag of treats upon our arrival. The pet-friendly rooms on the ground floor each have their own exit doors to the outside so you can easily take your dog out for pee breaks. The rooms are very clean and new. There is a small pool and hot tub which are great, and a very nice gym. 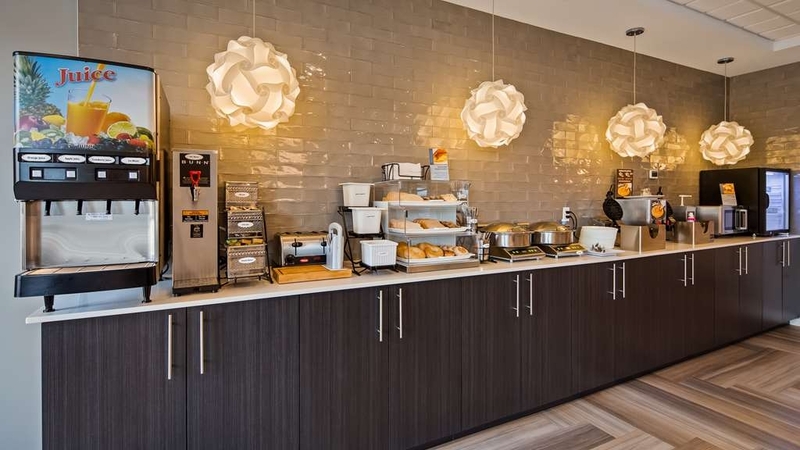 Breakfast is included with your stay and has everything you could want in an easy breakfast buffet. There's also a Boston Pizza restaurant right next door if you need dinner or a late night snack. I've stayed at this hotel three times while in the area and will definitely stay again. Thank you for your review. Not only are we a pet friendly hotel we welcome them! We know how difficult it is to leave you pet behind while travelling so we say bring them along. Glad to hear you got to utilize all of the other amenities we have to offer. If you are ever coming through again - stop by and relax for the night! Checked in last minute and the staff was super nice.. went to our room and just love that it was clean.. nicest part was we couldn't hear anyone else's room like other places sometimes... Definitely staying there again. "The Best Little Hotel in the West!" We stayed at the Best Western Plus in Merritt, British Columbia twice this year – once in August and once in September. We liked it so much we couldn't stay away! On both visits we were on motorcycle trips and needed a central and easily accessible location from which to come and go. This hotel really worked for us. Merritt, British Columbia is located 271 kilometres (168 miles) northeast of Vancouver in the heart of the Nicola Valley. The population is approximately 8000, and it's the commercial centre of the area. The Nicola Valley is also home to a number of First Nations including the Upper and Lower Nicola Indian Bands. Europeans settled in the area in the mid-1800's. We chose to stay overnight in Merritt because it was the perfect mid-way point in our ride from Vancouver. There are quite a few great motorcycling roads in and around the area. We particularly enjoy the route from Pemberton to Lillooet via the Duffy Lake Road! If you're a motorcyclist riding in the Vancouver area, Duffy Lake Road is definitely a must-do! I love riding these roads on my Triumph Trophy. Great twisties and lots of wide sweepers! On these weekends in August and September, we enjoyed the route so much we rode the same route twice but reversed it on the second weekend! 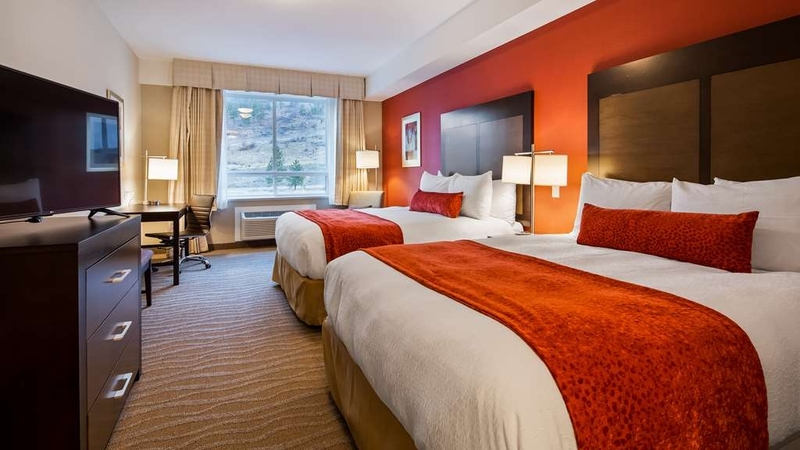 The Best Western Plus in Merritt is a new 83-room hotel, and is Merritt's largest hotel. It offers a complimentary full breakfast, fitness centre, pool and hot tub, guest laundry and meeting room. There are also electric vehicle charging stations. High speed internet is complimentary as well. I have Platinum status with Best Western as Best Western status-matches with SPG/Marriott. When we checked in they were pleased to provide us with a room upgrade to a great room with a huge balcony overlooking the nearby mountains. 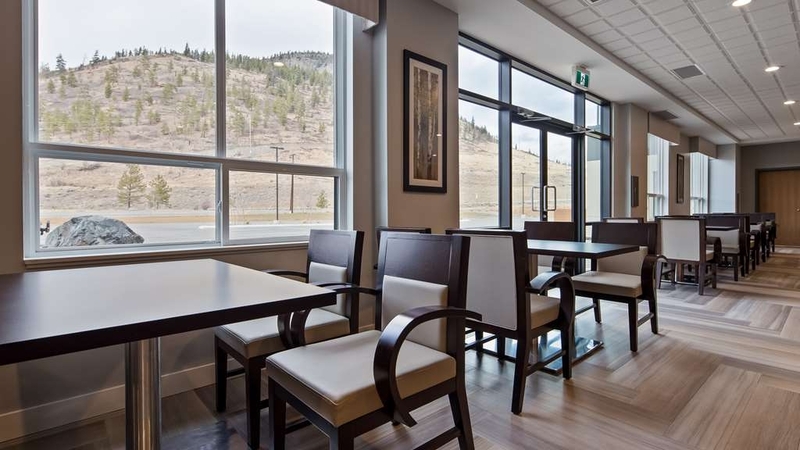 Pro's: Central location: easy to get to and from several of the main highways going into and out of Merritt Nearby restaurant: Boston Pizza – great for riders hungry after a long day on the bike and within easy walking distance! Great pool and hot tub. We really enjoyed this amenity and it was impeccably clean Tasty free breakfast! There was a wide variety of choices including sausage, eggs, waffles, different breads and bagels, muffins and fruit. Beautiful lobby area with comfortable sofas and chairs New hotel with up to date décor – very clean and comfortable. Cons: Only one restaurant within walking distance A bit of highway noise Helpful Tips Book early as this hotel is popular with tourists and business people Motorcycles can park directly in front of the hotel, under the large awning Join the Best Western loyalty program for points towards your next stay Our Rating We rate our stay at the Best Western Plus in Merritt as 4.5/5 stars. We loved the hotel amenities, the comfortable room, the free breakfast, and the clean and beautiful hotel décor. We'll definitely be staying here again! We were in Merritt this December for a hockey tournament. We pulled in late on a Friday and appreciated the covered entrance, well lit lobby, two welcoming staff working, and the invitation to help ourselves to the fancy latte/coffee machine to warm up. The lobby looked amazing, partly due to the facility being just a year old, and partly due to the fact that the staff and their families had recently decorated for Christmas. Check-in was quick and easy. The staff were professional and friendly. They apologized that our room was not with the rest of the team (as we had booked using hotels.com). They tried to move us but there was not a room with the rest of the team. We didn't really mind - but we sure appreciated the effort. Our room was clean. It was pretty cold when we checked in (better for the environment, right? ), but we soon had it nice and warm using the in-room air system. The TV has great 4K Telus Optic. Again, as everything is new, the room was in great shape. The beds are very comfortable. The breakfast area is expansive, well-lit, and warm. It would be a great place for a gathering, though this wasn't permitted (due to the variety of drinks we were having at night). We tried to congregate in our hallway, and the staff were fairly reasonable as they informed us that this wasn't fair to other guests. We understood. Our group would have liked to have a place where the adults could socialize without disturbing others. On the second morning we had a very early game and I arrived back at the hotel as breakfast was ending (10AM). I expected the food to be whisked away and for me to be turned away, but the two ladies working in that area encouraged me to grab some coffee and eat some eggs and sausage. I was very happy to have an opportunity to get breakfast, even though I know it was delaying their ability to clean the area. A couple random observations: The new door latch systems prevent one from keeping the door from locking, but also spare you from the halmark "CLUNK" of doors smacking shut. This contributed to a very restful experience. We couldn't figure out how to switch the input on the TV (for the playstation we brought with us for the first time ever). We ended up just disconnecting the Optic box and it worked fine. The rooms have a fridge with a small freezer. Showers are hot, good water pressure too. The boys really enjoyed the hot tub and pool. Boston Pizza is next door. Our manager pre-ordered for every family and the team had a dinner there that was quick and painless. Overall, if I'm ever back in Merritt for hockey, this hotel is a no-hesitation-automatic choice for us. It's probably the best overall hotel experience we've had in five years of hockey. It really felt like home. I can't say enough good things about this hotel! We had never hear of Merritt, BC and we're unsure of what we would find for hotels. We just knew we wouldn't make it to Revelstoke due to poor road conditions. Upon check in we were greeted by the friendliest employee who went out of her way to assure our comfort! She even allowed us a bit of time in the hot tub after hours as we'd just come off a harrowing trip on the Coquihalla Hwy. The hote itself is beautiful, the rooms are clean and spacious and the breakfast was delicious with many options including gluten free! Would definitely stay here again! Thank you for your review! Yes Merritt has a top notch accommodation stop! 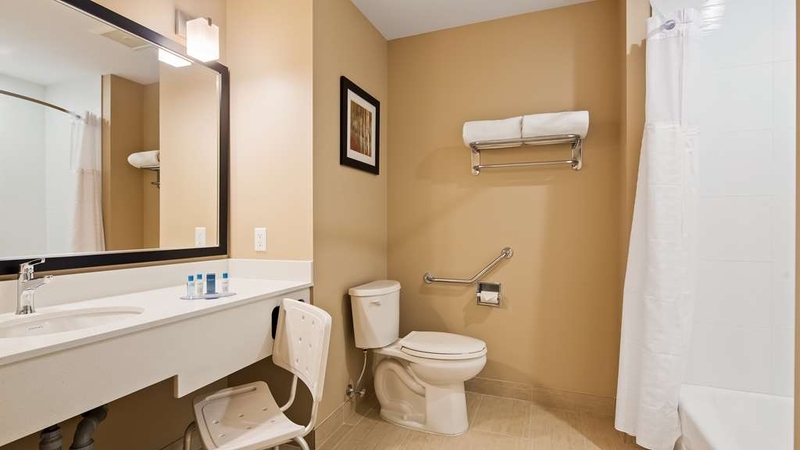 The newly built Best Western Plus offers all travelers a full range of amenities to enjoy. Our great location with food and shopping nearby make it a very convenient resting place for the night. If you are ever in the area again our staff and management invite you to come and enjoy the hospitality! 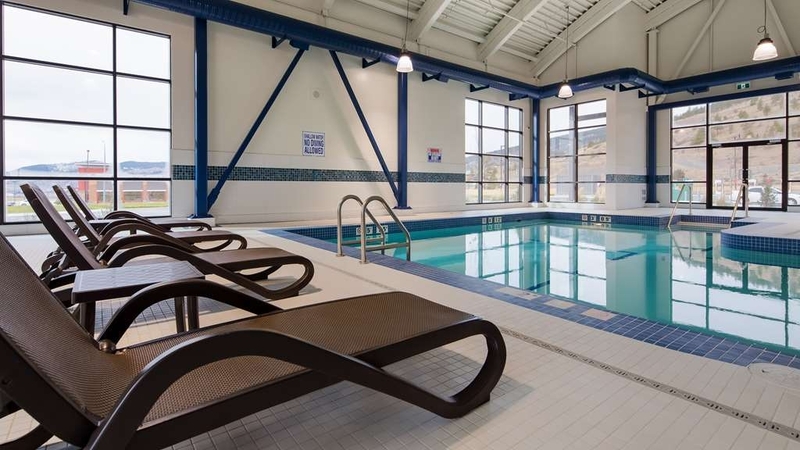 Best Western in Merritt is a lovely new hotel that is clean and modern. Staff are well informed, professional, efficient and friendly...and always find time to answer questions about local events or attractions. Rooms are large and quiet, Wi-Fi is strong, and parking is well lit, above ground, and close to doors (important to women business travelers). This property also offers a full complimentary breakfast with a number of stations from waffles to fruit and yogurt...so something for all tastes. It also has a fitness facility and pool, which unfortunately we haven't tried yet, but will on next visit. Finally, this property provides exceptional value with competitive rates. I would highly recommend this Best Western...it's like staying with friends! Thank you for your review and for staying with us! Staff and management work hard everyday so all of our guests enjoy their stay. Making everyone feel at home is a goal of ours and it is great to see we are achieving it. Whether you are needing information regarding the area or require a fulfilling breakfast to start your day, we are there to help. We thank you for the recommendation and invite you to stay again soon! "Overnight stay with our dog"
Great stay, we had a "pet friendly" room with an outside door which was very convenient. The room was stellar and clean. The grounds were also great for walking our dog. As a bonus, our dog received a "gift bag" from the front desk. From check-in to next morning free breakfast and check-out, I can't complain about anything-staying here again on our way back up! Thank you for your review. The Best Western Plus is happy to be a pet friendly property. Our designated pet friendly rooms allow you and your four legged companion enjoy a restful and convenient stop. Thank you for staying with us and we look forward to seeing you in the near future. We stayed two nights here for a hockey tournament. It's a nice new hotel right off of the highway. Boston Pizza is next door. Friendly helpful staff made our stay a positive experience. I highly recommend this hotel to anyone staying in Merritt. Thank you for your review. Our staff are always working hard to make sure each guest has an enjoyable experience. Our convenient location and quality product has quickly become a travelers favorite. We look forward to seeing you soon! 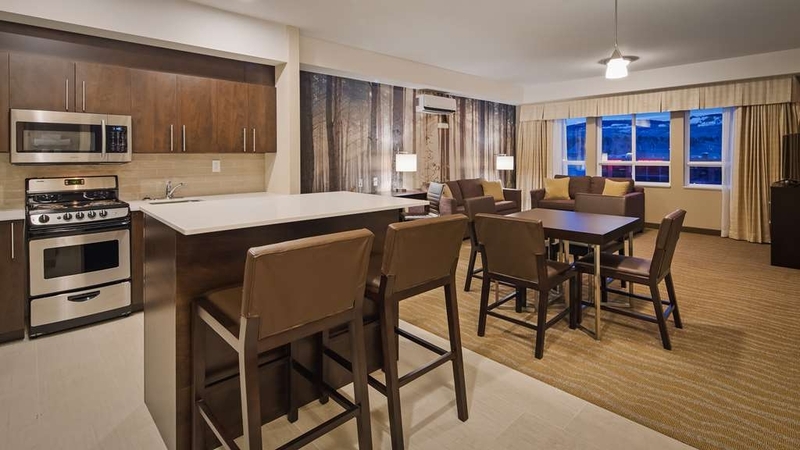 The new Best Western Plus Hotel is a wonderful addition to the accommodation facilities in the Nicola Valley. It is decorated beautifully, extensive room choice. Staff is very friendly and competent. Just off the north interchange, Boston Pizza and Wal Mart close by. Thank you for your review. Glad to see you chose Merritt as your stop. The Best Western Plus in Merritt provides a great resting spot offering quality accommodations combined with a convenient location. Thank you and see you again! 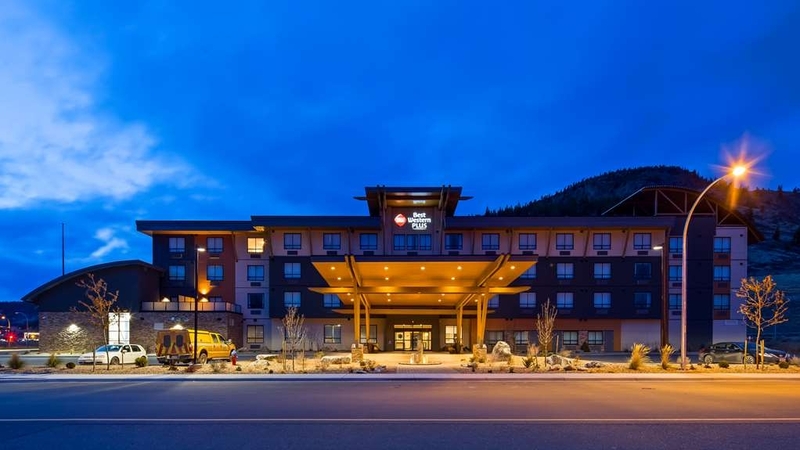 "Excellent Hotel Exceeded All Expectations"
My wife and I escaped from Vancouver to Merritt for a spur of the moment 3 day weekend away from all the "stuff' of a busy extended family in Vancouver. Chose the Best Western Plus as the reviews on here were Amazing. And they turned out be everything we had expected. We had a fabulous 2 nights and 2.5 days at the Best Western Plus Virtually everything was 5*, from the size, decoration and amenities in our King Room, to the gorgeous, spotless facilities, like the pool, hot tub, common areas and the wonderful breakfast room. I cannot recommend it enough. It is that terrific. Anoop and Jaz were exceptional managers and proprietors and ensured everyone's stay was the best it could be. From my 5am conversations with Anoop while we waited for the 6 am breakfast, in front of the fireplace in the lobby living room area and had some of the best made to order coffee, I've had in North America. Breakfast is terrific and the women who ensures fresh baked goods every morning along with a Full Breakfast Buffet and all for Free. She does it with a bouncy attitude and huge smile. We loved the place and will be back often. We've often stayed at 4* and 5* hotels in Whistler, Banff, Toronto, Ottawa, NYC, London, San Francisco, Napa, Dallas, Miami and much more and those places, in many ways, cannot compare with this out of the way wonderful hotel The rooms were lovely and the bed was one of the most comfortable we've had in a long time. We will be back and will always be quick to recommend it as an easy, quick get away from the hustle and bustle of Vancouver Merritt is a quaint little town with an intriguing and interesting history. "Another Best Western Plus Hotel with high standards"
Hotel was clean with a nice layout. Rooms were large and the carpet (where most hotels begin to fail) was very clean. Housekeeping seem to do a wonderful job. Pool and Hot Tub water was clean but the Hot Tub could of been a little bit warmer. But there was a lot of people in the pool area (which did make me enter at a later time), so that could of been the cause (I not sure). The Front desk personnel named "Samuel" (hope I got his name right) was friendly and went out of his way to accommodate me. I recommend this place to anyone who travels in this area. Arrived fairly late at hotel. Staff was great. Gave me a room with a balcony even though I was only staying one night. Lady who checked me in was accommodating and friendly. Room was a pleasant surprise. Extremely clean and welcoming. Thank you for your review. Our goal is make sure each and every guest feels at home while they are visiting us. We thank you for coming in and look forward to seeing you soon! "A gem in the valley"
Nestled in the middle of nowhere - this brand spanking new hotel sits. Spotless clean, warm and friendly staff , decent size rooms and a stellar breakfast bar included with your room. Only bad part? Lousy coffee. Thank you for your review. Your full review educates us on what we are doing well and what we can improve upon. Since reading up on your suggestions we have begun to look at a variety of different coffee flavors for our breakfast area. However, we will continue to carry our specialty coffee machine in the lobby which has proven itself to be very popular. See you soon! Service is great, Beds are comfortable, Breakfast is good and certainly more than the traditional continental, Hotel is exceptionally clean. Lots of extras at this hotel compared to others. Would stay here again. Thank you for your review. Staff and management are so delighted to hear you were fully content with your stay with us. Feedback such as this invigorates us and encourages us to try harder to provide our guests with a better experience next time. We look forward to your return visit! Thank you for your review. We are privileged to be the host hotel of PFR along with many other events in the Nicola Valley. We thank you for choosing us and look forward to hosting you next year! After a three hour dark and wet drive from Vancouver I desperately needed a good bed. I was not disappointed. Such a good sleep in an extra clean large room. The breakfast was spot on. Lovely lady assisting at breakfast. Front desk gentleman very polite and courteous. A well oiled machine all round. Praise to all the staff. If all Best Westerns could follow suit. I will most certainly stay here again. Thank you for your review. We are so glad we could provide you with the clean and comfortable stay your required at the end of your stressful drive. We pride ourselves on the comfort level that our guests enjoy. All staff members work hard to make sure guests are feel welcome and are comfortable from check in to check out. We look forward to hosting you again! We loved this hotel so much along with our 4 kids. Breakfast and a pool, everything was spot on & mommy LOVED the decor so much she took pictures of the flooring! The breakfast ladies helped accommodate our little crew and were so gracious and kind. Checkout was fun as we got our fancy coffees to go. The rooms were clean and even the sofa bed was comfy. Love this hotel. Will be back! I stay at the Best Western Plus in Merritt several times a year because of their clean and updated facilities and their professional staff. Location is conveniently close to the highway and local amenities but yet very quiet. Their staff is very accommodating and quick to take care of issues. Best western Merritt is a great hotel. We've stayed a few times and always find the staff to be very helpful. The rooms are clean and the beds comfy. We have a dog and this Best Western is extremely pet friendly. Thank you for your review. Thank you for becoming one our loyal customers! We will continue to work hard and provide you with the service, comfort and cleanliness you have come to know and deserve. We look forward to seeing you and your furry friend soon! This BW+ is a beautiful new property in a lovely location. From the welcoming and interestingly decorated lobby to our spacious second-floor room with a balcony overlooking the mountains beyond, we were delighted as soon as we arrived! The desk clerk was friendly and helpful. She gave us directions to some places we wanted to find downtown. The pool is outstanding. Good water temperature, pool of a generous size and a wonderful hot tub besides. We enjoyed our swim very much. Just wish it had been open early enough in the morning for a swim before breakfast (5 or 6 AM, perhaps?) The breakfast was also outstanding. We enjoyed our stay here very much, and if we were ever to return to Merritt, we would be sure to make reservations here again. Thank you for your review! We are so glad you got to visit our newly built property and even more thrilled to hear you had such an enjoyable experience! Our staff will keep working hard to keep this property at the highest standards and we look forward to your next visit! Stayed here with my wife on our way from Calgary to Vancouver. It is a new motel, with spacious rooms and great friendly and accommodating staff. The breakfast was great the beds were comfy. Easy to get on and off the highway. Overall was a great experience and we will most definitely stay at the Best Western Plus in Merritt again. Thank you for your review. Our staff is definitely most accommodating and very knowledgeable about the area. A great sleep and full stomach will get you off on the right foot. We look forward to your next visit! The BW in Merritt is a great place to stay. We stayed with our dog one night. The room was large and clean. The check in and check out was great. The facility was clean and new looking. Breakfast was a typical BW breakfast- We will return if ever passing thru the area again. Thank you for your review. We are a pet friendly hotel and welcome travelers who are bringing their four legged friends with them. Our spacious pet friendly rooms have unique exterior entrances so taking your pet for a walk is made convenient. Thank you for staying with us and we look forward to seeing you next time you are in the area! Thank you for your review and for being a return guest at our property. We did review your booking and have seen you stayed with us during a peak period when room availability was minimal and room rates were above average. We apologize we were unable to fulfill your room request and hope to do so in your next visit. The 6am start time for breakfast on weekdays has proven adequate for majority of our work crews. If not we provide "To Go" bags prior to that and our 24 hour coffee bar will get you going in the morning! See you on your next visit! The hotel staff at the best western plus is very courteous and pleasant. It's a quiet hotel with free breakfast. A great assortment to choose from. Cereal, waffle station, eggs and omelets, sausages, oatmeal station. Assortment of drinks, they also have hard boiled eggs and yogurt. The beds are very comfy and room is comfortable. We stayed in room 220. It has a nice view with a balcony. The room also had a microwave, sink, and fridge with freezer. I would definitely recommend this hotel. We didn't get to check out the pool or hot tub, but the pool area looked nice. "Great Hotel. Clean and super Continental Breakfast." Good place for an overnight stop when driving in and out of the lower mainland. The continental breakfast was great and included. The rooms were big and new. Super clean. BP across the street and open late. "First Night and Last night of our Vacation"
Both nights we stayed at this hotel on our trip. the staff are friendly and helpful. It is a great place to relax in the middle of nowhere. Breakfast is hot with plenty of choices. The place is clean and the hot tub is a nice place to relax after a long days drive. Stayed here for 4 nights while attending a family wedding. Great hotel, from the check in to the check out. Room was huge (king sized bed one on the 4th floor). Lovely room, lots of amenities, coffee bar for morning was good. Breakfast downstairs was excellent. Great selection of cold and hot foods. Get to make your own waffle with lots of syrup. YUM. There is a pool, which we didn't have time to partake of, but looked good. Air outside was smoky so a bit of smoke came into the room through the air conditioner but that couldn't be helped with the amount of fires in the area. Didn't affect the sleep. Would definately stay at a Best Western Plus hotel again. We look forward to our stay at this hotel, whenever we go to BC. It is extrememly clean, staff is extremely friendly, and the breakfast is fantastic! You won't be disappointed if you stay here. It is an excellent hotel. "A Great Hotel for A Great Price"
I stayed for a week in August on business. I was given the option to choose my room upon arrival and front desk staff made sure I knew the positives and negatives of every possible room selection. I was extremely happy with my stay. I experienced no issues. They have a great breakfast set up, a great coffee/tea station in the Lobby and helpful staff. I recommend this hotel. Super clean and comfy room, great price for a nice room with a comfy bed. Great coffee with flavored cream, good breakfast with a lot of options including gluten free and dairy free options, had fun in the nice pool and hot tub. Overall great stay and would stay again. My family stayed here briefly during a cross Canada summer holiday. Very nice new hotel in an area easy to access from the highway. Close to many restaurants. New, clean, well appointed. We appreciated the free self serve breakfast and liked that it opened at 6am. Would absolutely stay here again. Thank you for your review. Cross Canada summer holiday - must have been quite the adventure! During that time spent on the road you must have encountered many accommodation stops. So a great review coming from yourself means a lot. We thank you for staying with us and hope to see you on again on one of your adventures another time! Stayed here for a music festival beginning of the month and I have to say this is probably the best hotel I've ever stayed at.. The staff upon check in greeted us with a very warm and pleasant welcoming, and offered us shuttle information to the festival. (Which was awesome given we thought we had to cab) We got to our room and it was huge ! We stayed in a standard king room me and a girlfriend. We were both so pleased with how comfy the bed was !! The continental breakfast had waffles , eggs, cereal, yogurt l, fruit , bagels , toast ... you name it ! So worth it after a hangover. Thank you Best Western for the great stay. I will definitely be recommending this hotel to my friends when we come up for Rockin River next year ! Thank you for your review. Great to hear you enjoyed Merritt's famous music festival! It is a busy time for us so our staff work tirelessly to make everyone's stay special. We look forward to hosting all festival goers again in 2019! "Everything you'd Expect and Need"
This is a very well equipped and well run hotel The fellow at check in was helpful and efficient. The room was very nice. Good climate control, microwave, refrigerator, coffee maker, nice TV selection and both wired and wireless internet, as well as a comfortable bed and properly equipped bathroom. The breakfast was more than adequate, ample free parking, etc. It was a good place to stop off while driving to Vancouver. Thank you to the management and staff for a pleasant stay. I was left with the impression that it was "run by people who know how to run a hotel". Wow, thank you for the great review! Since opening approximately a year ago staff and management have been making sure all of our guests are well taken care of and are delivered the stay they deserve! It is responses and results like this that encourage us to continue to put in the long hours and hard work so we can build lasting relationships. Once again thank you and we will see you on your next trip through! Were all Best Western properties of this calibre I would gleefully never stay at my preferred Fairmont / Raffles accommodation. Upon checkin I met Mr Anoop Sekhon - the General Manager & Owner. The property is on a vast track with more than ample parking, plenty of disabled spots, marvellous access o. Two sides, and a tremendous Lobby and room doubling for breakfast. The pool is grand, the tub wonderful. A large deck indoor and out presents itself. Rooms are extremely clean and well kempt. TV is large with a superb array of channels. The room contains a microwave and a mid sized fridge with a separate and large freezer. And a separate sink. The bathroom comes with a nice line of lotions & soaps. Curtains, sheers, and blackout are well met. The bedding is wonderful. Breakfast is the nicest layout seen with perfect use of an island. Gathering spots and tables in a well lit area is appreciated. At breakfast I met Mrs Sekhon. She runs a tight ship during breakfast and is most well suited to this property and deservedly proud of this business. I shall attend again. Thank you. Thank you so much for the earnest review! This property is run with genuine care and we are so happy to hear it is showing. It is great to see that we are competing with such high end brands as the Fairmont! We will continue to keep our property up to high standards and apply a quality of service that will keep clients such as yourself coming back. Thank you so much and see you soon! "On our way back home"
We needed a place to stay between the coast and rocky mountains, Best Western Plus Merrit Hotel was our choice. Had no idea the property was so new! If you have family or more than 2 persons- this room is awesome! Plenty of space, and the full kitchen is well equipped. Overall very beautiful room. The breakfast room was also very impressive, with a good selection. And the hot drink machine in the lobby area, is a nice touch. Thank you for your review. Yes, we are the newest property in Merritt! With the quality of the Best Western brand and the extensive time and energy put in by staff and management we have become the premier accommodation spot since opening a year ago. A variety of room types allow us to accommodate all guests with ease. Thank you and and see you on your next trip through! I had a lovely stay with my two young daughters and my grandmother. We were in town for a funeral and arrived early in the morning. We checked in early, which was incredibly helpful with my two young children. This allowed us to enjoy the hotel, pool, and relax. The following morning, we enjoyed the pool and were also accommodated to access the pool 10 mins early. I appreciated this, as my daughters wake at 5am. Breakfast was lovely with loads of selection. The coffee in the lobby was delicious and I wish I had that machine in my house. The staff was incredibly friendly, and smiley. Thank you again for the wonderful stay. We sure loved our home away from home. Even if it was only for one night. We decided to stay here rather than camp when the weather turned. What a nice hotel. The staff were friendly, the room was very nice, and it has one of the nicest breakfast areas of any Best Western we stayed in. ( and the food was good ). I would not hesitate staying here again. The rate charged was very reasonable for being a last minuet booking. "My stay in Merrit, B.C." I was in Merrit for business the week of Aug 7-10 and stayed at the BW. It was great, clean, and friendly. Next to a Boston Pizza and Wal-Mart so no need to drive anywhere after getting back to my room. I will be returning for another week in August as well. We were stuck on the highway between Merritt and Kamloops behind a bad vehicle crash. After a couple of hours and sunset coming on,we busted out of the line and headed back to Merritt. My wife booked this hotel on the way,and when we arrived with our VERY exhausted 4 yr old,the lady at the front desk was fast,efficient,friendly AND very comprehensive in her explanation of the great amenities at this hotel. MUCH APPRECIATED! The room we stayed in was a dbl queen. Very clean and comfortable beds. The washroom was a bit odd...the door barely clears the toilet as it opens..but hardly a problem for a short stay. My daughter wanted to play in the pool since she'd been strapped into a seat for most of the day. The pool at this hotel is great! She had so much fun. Very worth the time to give it a go! In the morning we had a long drive ahead and the breakfast at this hotel was totally acceptable and with a good selection to start the day off. The lady who was looking after things in that area was super nice,and really hustling to stay on top of everything. Great job! All in all, when we travel again to the coast,we will stay in this hotel in Merritt BC. Beautiful valley views and nice people. When traveling to the coast I really think more people should drive by Kamloops and stay in Merritt! The town has a good selection of grocery,gas,and this hotel. Does that sound gushy or something?.... totally true though....just sayin. "The perfect stop on an interior business trip." On our way to Vancouver, was a great stopover from Calgary. Easy access off the highway, next to Boston Pizza. Very nice rooms with balconies on the 2nd floor. Great buffet breakfast with lots of choices. Very comfortable and I would highly recommend. One of the nicest Best Western hotels I have stayed at on my travels. Probably one of the best we've stayed in. Super modern with a great vibe, a free up-grade on arrival, very professional staff and a good selection of hot and cold breakfast options. Our room was spacious with an extremely comfortable bed and was spotlessly clean. A great choice for a stop-off on our way to the west coast ..will be our first choice when next in this neck of the woods. Thank you for the review. Very positive to hear our staff recognize BW Rewards members and are forwarding upgrades when available. Since opening less than a year ago, the building and design are receiving great feedback such as yours! Thank you for coming in and we will welcome you again with a spotless room and comfortable bed next time your in the area! "Excellent value for money, great breakfast, friendly staff." Quite new, stylish and clean hotel with very friendly staff and spacious rooms. Breakfast was fantastic and was served until 10 which we appreciated. The only downer was that some other guests started slamming doors at 4 a.m. But you can't blame the management for that. Thank you for your comments and review. Glad to hear you enjoyed the property and the amenities we have to offer. Our breakfast consists of many hot and cold items along with lactose and gluten free items. We thank you for staying with us and look forward to seeing you again! "Great location to stop by"
On my way back to Vancouver from Vernon, stopped by this Best Western Plus property in Merritt, BC Traveling with Daisy (my Pet Frenchie), we always have to find pet friendly locations to stay, and this is our first time to stay here! Our Front Desk Lady; Danica is especially professional and friendly, she provided lots of information about where to eat and also some local attractions information! Her warm welcome made all the difference! I am sure I will come again when I'm traveling the part of the country! As you can see from the photos, the room is very spacious and bright with nice amenities. We were provided with a special room ( with a private entrance to outside )so that it's easier for me to take Daisy out for walks. There's a hot tub and a pool for you to relax after a long day drive! "Great for a quick stopover"
Just off the highway....easy to get in and out of. Near a Walmart and Boston Pizza. As most reviewers have mentioned this is a new property so everything is in new condition. The lobby area was amazing and included free latte, coffee, tea etc. The breakfast area was very large which was a nice treat not having to wait for a table. The front counter staff were very friendly and most accommodating. Considering this is beside the highway, it was amazingly quiet. Most rooms Do NOT have balconies which is a shame. We really enjoyed our quick stop over with our only complaint being that there was not a table in our king room. Not ideal for take out but we managed. Would stay here again. Thank you for your review. Glad to hear you had a great experience at the Best Western in Merritt! The over-sized breakfast area and specialty beverages in the lobby are some unique touches that have created repeat customers in less than a year. 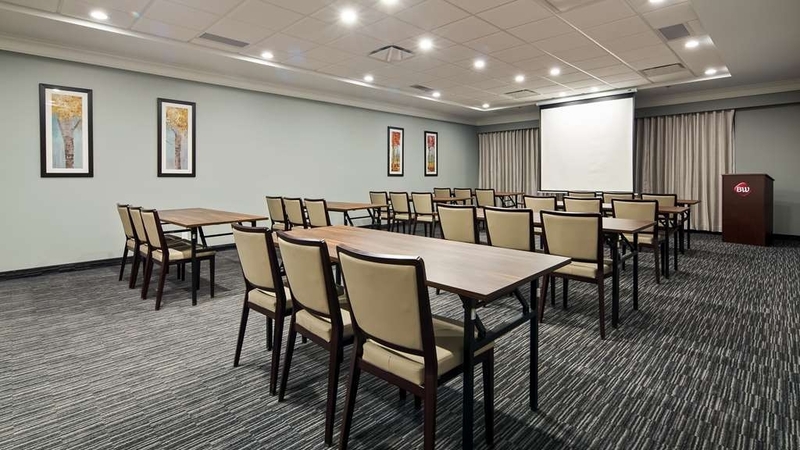 We understand the room may not be the ideal set up to have your meal which is why we welcome guests to use the breakfast area after hours for evening take out meals or just for a communal gathering area. We look forward to hosting you again and next time give us a call ahead to book one of the balcony suites! Stayed here on our road-trip through the Rockies. Nice spacy room for my whole family of five. Good breakfast an a very friendly staff. Also enjoyed a swim in the pool in the morning. The kids really enjoyed it. Right off the highway. Great value! Thank you for your review. 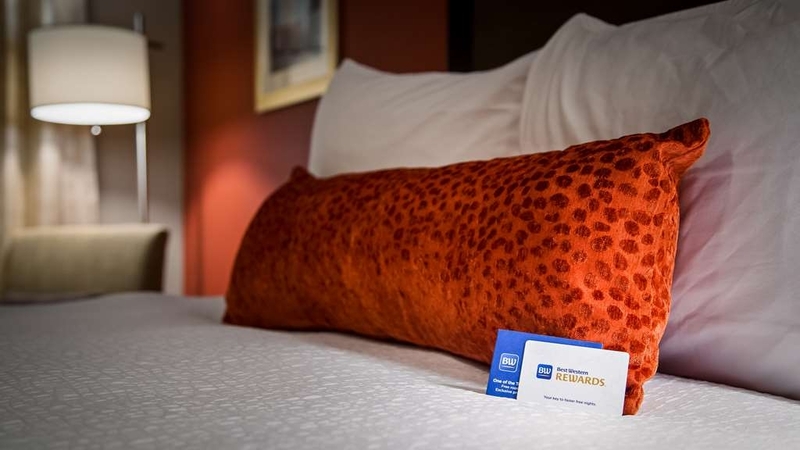 Pairing value with quality is a balance we feel Best Western has achieved. Our spacious public areas such as the pool, gym and breakfast areas have proven themselves a huge hit. 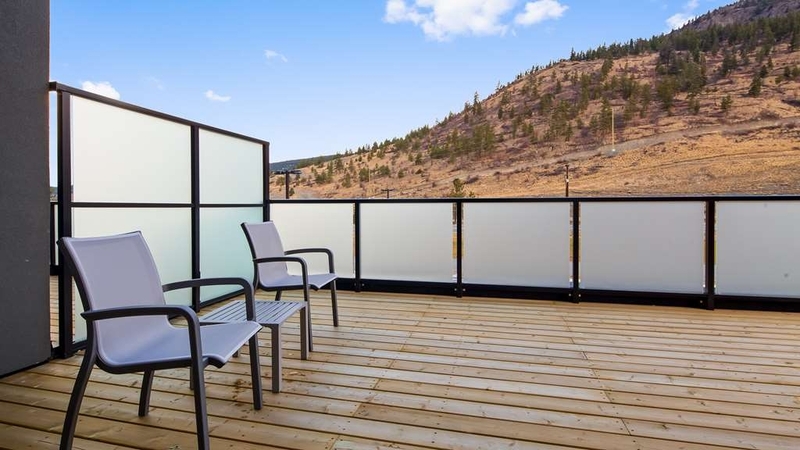 While you are relaxing in your spacious guest room you can enjoy the views that are offered of the Nicola Valley. Thank you for coming in and we look forward to seeing you again. Great property. Easy and efficient checkin and Express check out. Great rooms; nicely appointed. Awesome bed and pillows, fridge and microwave topped it off. Quiet which was appreciated being so close to the main highway. The breakfast is pretty good; both warm and cold foods. A one minute walk to Boston Pizza; a two minute drive to a variety of other eating establishments. Thank you for your review. This property is set to accommodate a variety of clientele. Whether it is a corporate trip or a family vacation we will add a positive note to your travels. We are proud to offer quiet rooms with great location. We look forward to seeing you again! Great new facility, same great Best Western customer service. Immaculate new building just off the main highway. Within a minutes drive of all your major passing through stops ie. gas stations, food and Wal-Mart. Rooms are clean, large and modern. Breakfast is delicious and serviced in a wonderful sitting area. Pool with hot tub and a gym with all the equipment you'll need. I'll definitely be staying here again. Thank you for review. We always love to hear from a loyal Best Western member! With a great location and a brand new building we offer our guests a quality accommodations at a great rate. A top notch breakfast program, private decks and many other amenities you need the Best Western Merritt Hotel is the right choice! See you again on your next trip! "Well located, very helpful staff, immaculate room, great breakfast"
This is a relatively new property situated on the east side of Merritt. Checkin staff very helpful with suggestions on where to eat locally (somewhat limited options in Merritt) but her recommendation was perfect. She also provided other helpful advice. And so pleasant was the check in lady she came over to our breakfast table the next morning just to ensure we were enjoying ourselves-which we were. Breakfast beautifully done, lots of choice, lovely large airy room. Hotel has swimming pool with lots of natural light..great on those winter days yet to come. And hotel price particularly affordable with book/pay in advance option.Room was immaculate with a view over the spectacular Nicola valley. We will definitely be back. Thank you for your review! Staff and management have been working hard since opening to provide our guests with the experience they deserve. We are always more than happy to act as your guides to the community! With a spacious comfortable room and a diverse menu our breakfast program sets us apart from any property in the valley! We invite you back again to enjoy the beautiful valley views from your room along with all of the amenities the property has to offer! See you next time. This is a new Best Western Plus and the amenities are great. Lovely room, well furnished and very pleasant friendly staff. The breakfast and the dining area are open, attractive with excellent food, served piping hot. Thank you for your review. We are very happy to hear you had a great experience at our property. The large spacious property is proving itself with our clients and our staff will consistently keep a high level of standard for them as well. We look forward to seeing you again soon! brand new hotel, everything is clean, smells good, eveything is new, the staff is courteous, the breakfast is common to this type of hotel , no surprise. this is no downtown area so it is quiet. restaurants nearby. I normally stay in either kamloops or kelowna but thought I'd give the bw in Merritt a try. Excellent property. Great staff. I was told the property has been open a year but it looks brand new. Well maintained. Large fitness, pool area and breakfast area. Comfortable beds and the rooms have all the amenities including a true freezer on the fridge. The only downside was the included breakfast which looks to have mainly processed breakfast items. This could be improved upon but an excellent place too stay. Thank you for your review. We are excited to hear Merritt was your choice and you enjoyed your stay with us! Providing a great breakfast experience is very important to us so your input is greatly appreciated. We understand some items paired with our bacon, sausage, eggs and fresh fruit are brought in. However, we are constantly changing and evolving to provide you with the best experience possible. Input such as yours helps us tremendously and we thank you for it. See you again soon! This was our first time at this hotel and definitely not our last. We were traveling from the Cariboo to the South Okanagan. This is a very new hotel, handy to the highway, very quiet, big comfy rooms, friendly staff, awesome breakfast, very reasonable price, close parking, nice pool and big hot tub with not too much chemical. Only 1 1/2 hours from Kelowna, where everything costs twice as much! Oh, and a big sundeck on some rooms. Thank you for your 5 star review! Many travelers coming through the area are discovering exactly what you have - high quality accommodations at a great rate! We are very proud of this property and all it has to offer. The Best Western Plus Merritt Hotel boasts unique features, new rooms with great design and comfort and best of all the greatest staff in the valley! Thank you for visiting and see you on your next trip through. My sister and I stayed at the BW Plus in Merritt after a meandering trip through the Douglas Lake road, before heading back to the coast. This is a terrific Best Western! The spacious room had a great view of the hills and though it was near the highway, we heard nothing even with the open window. The staff were all very welcoming and helpful. Breakfast was one of the best I've had and I use Best Western hotels almost exclusively. I will definitely be recommending this hotel. Thank you for your review. We are pleased to hear we could add a positive experience to your road trip! The Nicola Valley is a great place to visit and explore. 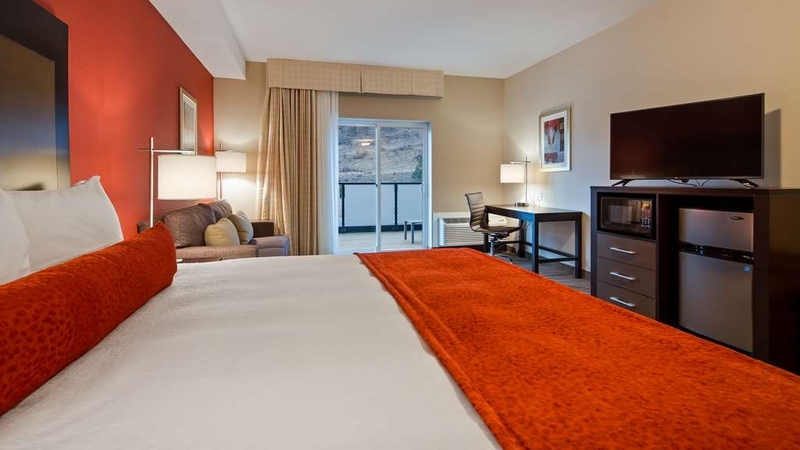 While you are in the area the Best Western Plus will give you the restful stay we are known for time and time again! Thank you for staying with us and we look forward to seeing you soon! My husband and I spent one night at this very comfortable hotel. Parking was well-lit and ample (car charging was available), reception was friendly, room was very clean and quiet. Breakfast was well above-average. We would definitely stay again. Thank you for your review! We are so happy to hear your stay with us relaxing and the services provided by the property accommodated your needs. We will continue to strive for the best for our guests and look forward to seeing on your travels again! We really enjoyed this facility as a stop on our way home from Banff. The check in was easy. The room was large, clean, and had a view of the interesting little airport across the way. We couldn't hear, but we could see helicopters taking off in the morning, which was entertaining. The air conditioner worked really well. Just a nudge to the thermostat and the temp was perfect. The breakfast was really good. The coffee was just okay, even in their fancy lobby Keurig maker, but no problem. The staff was friendly. We liked this place so much that we hope we can come back and attend some naturalist tours, just so we have a chance to stay here again. Because of this facility, we may start using Best Western more often. Winner. Thank you for your review. We take great pride in the fact that the property has been built well and is providing the guests with the quality accommodations they deserve. All staff and management are trilled to hear that the property left such positive impression. Best Western is a great brand to travel with and you will not be let down. See you soon! "Great choice for overnight stop"
We stayed for 1 night on our way from Quadra Island to Jasper. New hotel , rooms couldn't be faulted. Got a great price on expedia. Only down side for us was that we were looking for an early start on Sunday morning but breakfast at weekend starts at 7. There were quite a few having coffee at 6.30 whilst I was loading the car. Thank you for your review. Very encouraging to hear such feedback from a guest. We are glad to hear you enjoyed your stay. We continue to look at ways to increase a positive guest experience, breakfast start time change might be it. However, you are correct, we usually have 90% of the breakfast ready prior to our listed start times for our early risers to enjoy. Thank you for your input and we look forward to seeing you again. This is one of the best Best Westerns we've stayed at during our extended vacation. Everyone from check-in staff to breakfast staff were friendly and helpful. Our had a great view. Breakfast choices included dried cranberries for your cereal and almond milk to top it off. Thank you for your review. Our staff is delighted to hear they created such a positive experience during your stay! We have been trying hard at breakfast to get everyone started on the right foot and looks like we have accomplished our goal. See your soon! The service here was great from the minute we walked in the door. We were well oriented to hotel facilities, breakfast was great (they cater to dairy and gluten free diets) and all of the staff were exceptionally friendly. "Great hotel option in Merritt,BC"
Stopped by at the last minute. Great welcome, good value and shiny new facilities! Excellent pool and hot tub and a good breakfast included. Perfect for en route across the Rockies or a central destination on its own. After driving for hours, we pulled in for an overnight rest. The people were great and were informative of places to eat. The room was new, clean and quiet. There is a breakfast and ample seating area. We will be staying there again. When we were driving to he coast we made our stop for the night Merritt. We didn't know where we were going to stay so we drove for a bit. We noticed the Best Western Plus had a now open sign so we went in to see what they had. The lady at check in was very kind and while they had no more king size rooms available they were able to fit us into a suite with a king sized bed. That was lovely. The breakfast in the morning is like most continental breakfasts so we were happy to stick around for that. Checking out was fast and easy and we were on the road again in no time after a nice restful sleep. We had a problem at check in, but the hotel manager, who was about to leave home for the day, stayed to work out our check in issue. This is a quiet, clean hotel with great customer service. Breakfast was one of the best we've had. At first we were worried that the noise from the nearby highway would interfere with a restful stay. However, our fears were unsubstantiated. The room was very well sound-proofed. In addition, the room was at least 30 percent larger than the standard hotel-room. The kitchenette with hot-plates was a nice touch but not used by us during our stay. It was also nice to relax in the hot-tub after driving for 10 hours from Alberta. Please understand I do not do revues but this hotel deserves one ,after flying for 9hours plus then a Three hour drive we finally arrived at the best western to be met by a very pleasant looking hotel and being now 8.00 pm looked forward to a hot shower and good nights sleep. We were meet at reception by Denica and we handed her all our booking .com paper work only to be told the booking had not been made and the hotel was full!! After phone calls to booking . Com and the time getting on Denica offered us coffee while she tried to sort the mess out , after not very long she informed us that a two bedroom suite would be made available and she sorted everything out , what a room! And breakfast , and in the end a very enjoyable stay . I still have to sort out booking . Com but will say I use them all the time and have never had problems before,we understand Denica is of to Europe next week and has used booking . Com let's hope they have got hers and the rest of our stay in BC right. We just stayed there over the May long weekend and I have to say we had a great stay. The hotel was fantastic, clean, super comfy beds. My daughter loved the pool and the complimentary breakfast was really good. There were way more selections than I anticipated. Next time we stay in Merritt this will be the hotel we stay at for sure. We were attending Gold Country Geocaching event and also celebrated a milestone anniversary. We stayed for 4 days and were very impressed by the hotel hosting flood victims. Room was clean and breakfast was plentiful. "Unexpected Good Quality of Room"
Very nice big room and very comfortable king bed. Best sleep in a hotel room in years. Good breakfast and overall very good value for the rate. Easy access to hotel off Highway 5 parking in close proximity. Thank you for your review. Happy to hear our staff and establishment met your requirements. We look forward to seeing you on your future travels. Terrific presentation overall. Nicest breakfast room amenities I have encountered. Room was tasteful and comfortable. Check in staff member was efficient and thorough. Hotel is easily accessed from highway. Thank you for your review. Our breakfast is a popular amenity at our property and its great to hear you enjoyed it. See you next time! "Great service and hotel appearance!" This was a really great stay! The hotel itself is beautiful and the service was excellent. We had comfortable bedding and the breakfast was really good too. My only suggestion is to turn up the swimming pool temperature so it's a bit warmer next time. Thank you for your review. Great to hear you had a great experience at our property! The recommended operating temperature is 80 Degrees Fahrenheit. We will continue to monitor it and make sure it meets or exceeds this recommendation. See you next time! Stayed here recently for a volleyball tournament and the experience was great! The staff were very helpful and accommodating and the rooms were clean and spacious! We stayed in a kitchenette suite and it was perfect for us. Big fridge, stove top etc. The breakfast was good as well! Lots of options available. Will recommend and would stay again! Thank you for your review. Great to hear our property and staff were able to meet you needs. Our spacious rooms and public areas are built to handle group and high volume. We will see you on your next stay! Thank you for your review. Yes, we have gluten free items! Since opening our doors we have continually adopted our breakfast menu to meet and exceed guests needs and it is something will constantly to do so. Cleanliness is a huge part of being a top accommodation spot and we pay great attention to this. We thank you for staying with us and look forward to seeing you again next time you are in the area. "Always a pleasure to stay in this hotel." We have stayed here many times since they opened last year. Their staff are always friendly, the rooms are always very clean, and the breakfast is one of the best hotel breakfasts you will find. And the two owners are often on hand and very friendly and helpful. We enjoy staying here on our trips between Vancouver and our home near Radium Hot Springs. I travel a lot but this hotel is one of the best,facilities and staff. Having the buffet open at 5:30am for me was a big surprise, and having so many option not just an"Continental buffet".Rooms are clean,jacuzzi and swimming pool -good size. Everything still smell like new. (opened in June2017). The stay was an awesome stay for my son and I.... The breakfast area was a total dream... Large... No problem sitting any where... Very comfortable.... Definitely will be staying here again.... Anoop was super pleasant to converse with. We are just returning from a 2 night stay at the Best Western in Merritt. The staff are so welcoming and accommodating. The rate was great.. the breakfast came with many options..great fitness room... Nice pool area..Free beverages like specialty coffees, David's Teas &juice. If you need a place in Merritt stay here!! "Amazing hot tub and pool, with nice mountain views." The hotel was amazing, the rooms were clean, the beds are extremely comfortable and the staff are very friendly, professional and they were able to answer all of my questions. Lots of room in the parking lot and charging stations are very useful. Overall the hotel had a very chill vibe. Thank you for your review! Great to see you had a chance to utilize the many amenities the Best Western Plus Merritt Hotel has to offer! Having so much variety allows the property to provide a comfortable stay for everyone. Our staff have repeatedly shown they are the strong core every business needs and make all guest stays pleasurable. Look forward to seeing you soon, have fun in your travels! usually a great place to stay. management let guests bring in outside alcohol and drink it wherever they pleased, and for most of the day, resulting in at least five complaints to the desk, not including ours and the inability to enjoy the facilities offered. Police had to be called in after midnight. Thank you for your review. 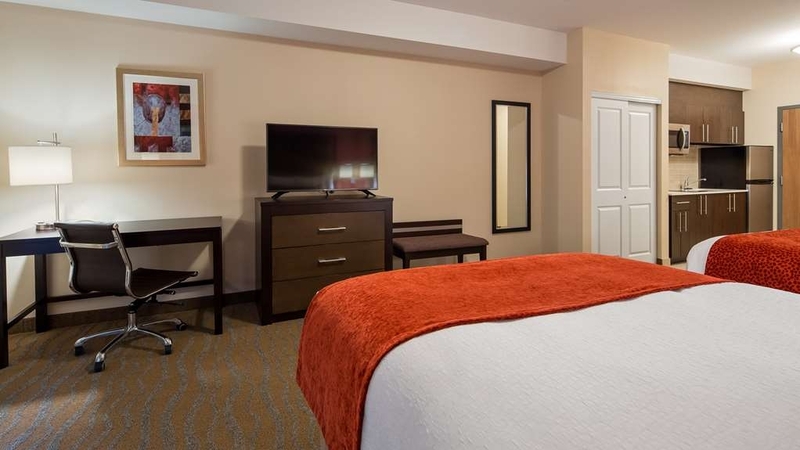 As you have experienced in the past Best Western Plus Merritt Hotel IS a great place to stay! However, from time to time all hotels experience unruly guests whom do not have the common courtesy to abide by the hotel rules and regulations, nor do they respect other guests staying at the property. Staff did constantly move the groups gathering in the public areas but they persisted to return. I was not aware of any police presence needed but if it was it would have been a last resort. We invite you to come back and enjoy a quiet, relaxing atmosphere (which is the norm) here in Merritt. We are sure you will realize this event was a one time occurrence. If you would like to discuss your stay further please contact us offline and I will be more that happy to review it with you. See you again! Great hotel with friendly, helpful staff. Excellent service. Attractive large rooms with comfortable beds.Good breakfasts with varied food choices. Coffee machine with high quality lattes on main floor. Pool and hot tub and gym room. Highly recommend this hotel. Thank you for your review. We are glad to hear you were able to enjoy all that our property has to offer. Your recommendation is greatly appreciated and we look forward to seeing you soon! We've stayed at numerous Best Westerns and were very happy to stay at Merritt's Best Western. The staff was lovely, the rooms modern and very clean and the breakfast was lovely with a large selection! The breakfast room is also very large and comfortable so they'll be able to accomodate lots of guests which isn't always the case at all locations. Thank you for your response. It is great to hear from a loyal Best Western customer. We are excited to hear our location was above your expectations and that everything during your stay was great! We look forward to hosting you again. This staff was very helpful, the room was nice, clean, and well appointed. The breakfast was AWESOME! The breakfast room was huge, bright, and comfortable. As vegetarians, we sometimes struggle to find enough to eat at "regular" hotel breakfast buffets. The BW had lots of options for everybody, including vegetarians. They also had non-dairy milk options, which was great. Highly recommend staying here. Thank you for your review! We are glad our entire property from staff to facilities met your expectations. We constantly try new items on our breakfast menu and your input is always welcome. Thanks for the recommendation and see you next time! Everything was in great condition. Clean, comfortable room and great breakfast. Stayed for 1 night as we passed through town. Conveniently located by the highway and a Boston Pizza. Only complaint is that they say the room has two queen beds, but they are more like doubles. Thank you for your review. Great to hear your stay was comfortable and our generous breakfast menu got you on the road full of energy! 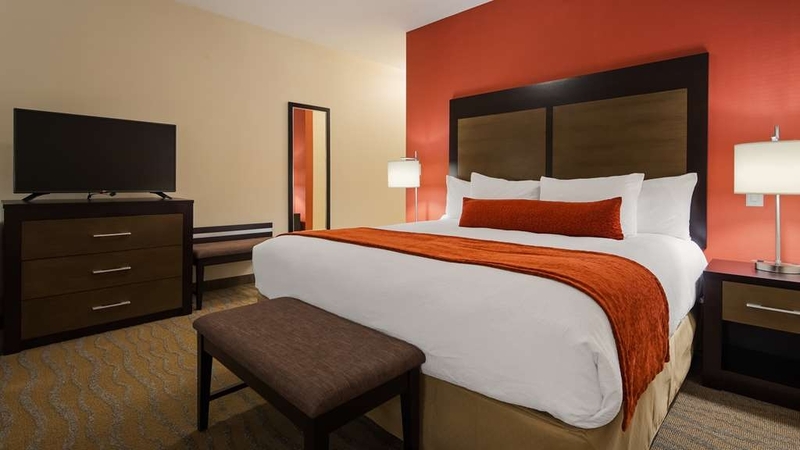 To my knowledge all rooms with 2 beds have queen beds however, guest comfort is first and foremost so I will confirm measurements with our Preferred Best Western Vendor whom supplied the beds. See you soon! I recently came in from a business trip in Vancouver and my sons were playing hockey in Merritt so the timing worked out great that I was done my work and could enjoy watching them. We got a room at the Best Western. It was great. We all slept well and enjoyed the continental breakfast and Used the convenient laundry facilities. When the boys advanced to the final they extended our check out time. Was very appreciative that we had somewhere to rest! I would definitely stay and recommend this Best Western! Thank you for your review. Your experience provides an ideal example of the versatility we have! Whether you are on business or pleasure, we have the facilities, and provide the service to make your stay the best it can be. Thank you for choosing us and we look forward to seeing you again. Excellent place to stay. New motel, super clean rooms and very cost effective to stay. It's across the highway from the town but has a BP restaurant right across the parking lot. Staff were great. Room was very quiet. Thank you for your review. Glad to hear your stay was comfortable and convenient. 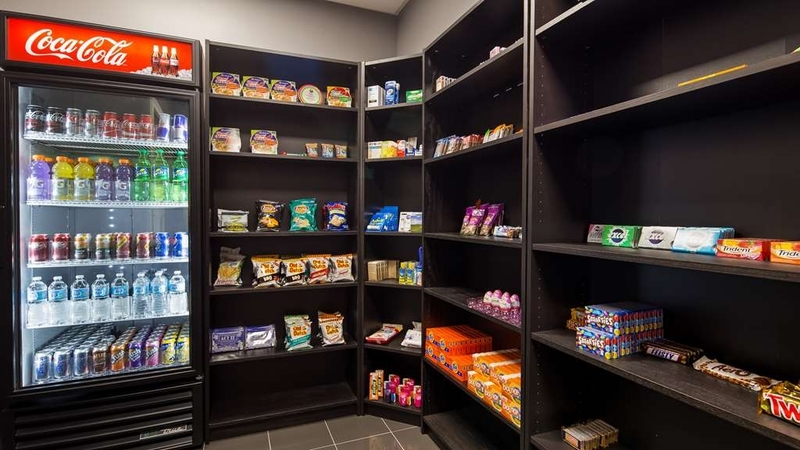 Not only do we have food and beverage facilities for the entire family nearby but there is a Walmart just a short walk from us for your shopping needs. See you again soon! Best Western in Merritt, a new property, very clean, very comfortable, friendly staff, excellent breakfast, fresh fruit and almond milk were a pleasant surprize. Enjoyed the hot tub and workout facility. Thank you for your review. Glad you hear you enjoyed the entire experience of a Best Western Plus property! Our staff, facilities and breakfast menu win the guest over time and time again. See you soon! "best western , super travel service, rebooking is a local matter, not via BW head office in USA"
Thank you for your review. We understand travel plans change and are will always accommodate you however possible. Glad to hear you will remain a loyal Best Western customer! Look forward to accommodating you in your future travels. "Couldn't find a better place in the middle of nowhere"
Quiet, clean, comfortable, modern. The breakfast was a true bonus: simple, yet varied. Quality items, not just a few muffins. I don't think this place has been around too long. A creative addition would be to remodel the grounds around the building so that during the summer, breakfast could be had on a quiet, protected patio. Thank you for your review. Great to hear you enjoyed the exceptional breakfast selection. You will be happy to hear we do have a patio which will open for the summer months for breakfast dining. Look forward to seeing you then! "Great Hotel with great amenities "
Stayed on business for 4 nights. Rooms and beds were very clean and comfortable. I have to rave about the coffee machine in the lobby brewing fresh cups whenever you want them. The breakfast was great and never a shortage of food. There was a hockey team staying there and the food was always replenished. Those boys ate lots and the hotel was prepared for them. I would definately recommend this hotel and would stay again if my travels ever lead me back to Merritt. Thank you for your review. Best Western Plus has a great breakfast program which is backed up by our great staff who are kept on their toes by the needs of the guests. Glad to hear you made use of the coffee bar, it is a unique feature enjoyed by many. See you on your next visit to Merritt! "very nice, quiet and clean hotel"
A wonderful, clean, bright hotel, great breakfast and even a cappuccino machine available 24/7 for customers, which I have never seen in a hotel before. Loved it. Rooms are very quiet and nicely insulated. Comfortable bedding. Nice pool/whirlpool with relaxing chairs available. Great place to stay with a family. Thank you for your review. All property features allow us to be the ideal family or business accommodation stop. Cleanliness and a nice, quiet sleep are our guests primary requirements and we are glad we completely fulfill them. Thank you for stopping and see you soon! "Great rooms, great views, great service"
The staff are both competent and friendly. There is a great coffee machine you have to try. The rooms are big and comfortable. The beds are super comfortable. 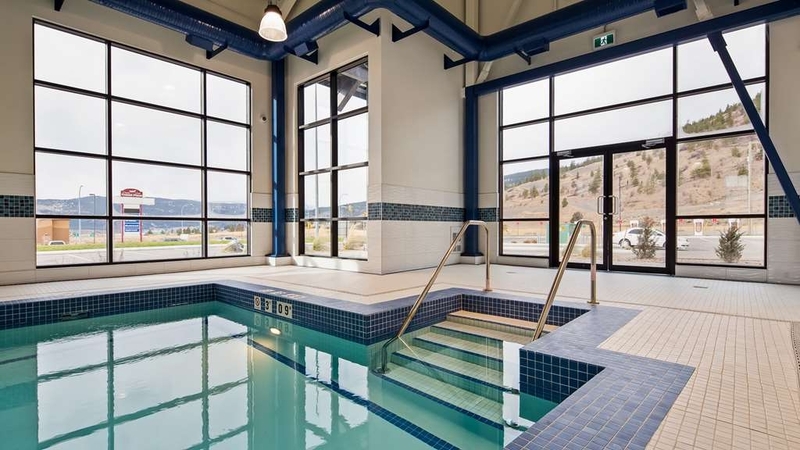 There is a great pool/hot tub facility with big windows that look out at the mountains. This hotel is a great place to stop if you are making your way across the mountains and need a place to rest up. It is across the street from a very nice Boston Pizza. And there are nine (NINE!) Tesla electric charging stations (i think...). I stayed here one night while in the area on business and would definitely stay again. As noted, the hotel is new so the spacious rooms are well equipped and the lobby and breakfast room are spacious. All areas were very clean and the staff excellent. It is a quiet time of year, so there was no noise. I did not experience any Internet or other issues. As well as a nice looking pool, there is a range of fitness equipment (not that I used it) including the option of taking a mat and weights into your own room. As a BW rewards member, I am glad they opened this hotel, and will stay here whenever I am in the area on business in the future. Was passing through Merritt and was making a rest stop after packing. Overalls the stay was pleasant, but guests here must be overloading the internet as interruptions were frequent and difficult to get actual service to view webpages and download content to my new smartphone. Had to go over billing twice as notes were not easy for staff to find from each other. Thank you for your review. We are glad you enjoyed your stay overall. 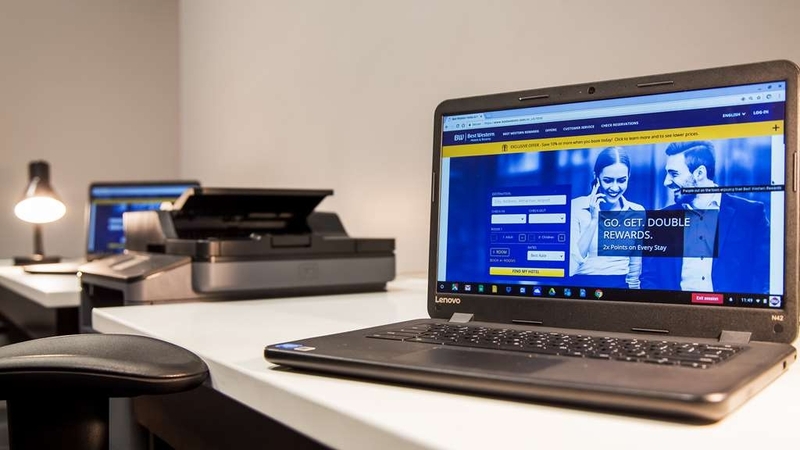 The hotel will be conducting speed and connectivity testing since interruptions should not be occurring with the quality of network that has been installed. Any errors found in the network will be corrected. Thank you for your input and we hope to see you soon. We were consistently pleased with all aspects of our stay. The hosts are courteous, attentive without being intrusive, and were responsive to our specialized requests during our five-day stay. The room was comfortable and well-maintained; as were all other facilities on the property. The breakfast bar includes excellent hot & cold selections. Hotel is geared toward business travellers, but the family we saw there was happy too. Can't wait to return! Thank you for your review. In all situations our staff will fulfill to best of our abilities any requests the guest may have, after all we are in the hospitality industry! We are glad to hear you fully enjoyed your stay, we have been working diligently on our breakfast to make it a prime feature during a guests stay. We look forward to seeing you soon! This is a new hotel. The rooms are very spacious and the bathroom was a nice size too! The beds were very comfortable and the pillows were nice. The hotel provides extra pillows as well. If I remember correctly their were four pillows already on the bed. The room was nicely decorated and very clean. The breakfast was good and well looked after. We would definitely stay here again, when our travels take us back to Vancouver island. Thank you for your review. It is great to hear you were satisfied with your stay at the Best Western Plus Merritt Hotel. We aim to go above and beyond your expectations and are glad we could achieve that goal. See you again soon! Very nice, brand new hotel. Very spacious rooms. Some rooms have balconies. Good breakfast included. Management was very nice and helpful. Was advised to book direct with Best Western app instead of Expedia. Thank you for your review. Yes we are the newest property in Merritt and take great pride in the standard of service our staff provides to the guests. Our over sized private balconies are a unique feature, which are great for those long summers. See you soon. The staff and the cleanliness were all so far above the norm that I have found in the past few years in different branded hotels that I was pleasantly shocked. The staff make the difference, the great jobs they do. The breakfast and area was great too. Thank you for your review. Staff are the key to any great business or organization and we are lucky enough to have some of the most caring and dedicated. They help our guests realize the Best Western experience! See you again soon! The hotel was fairly new and obviously extra care was taken to create a clean and welcoming public area. The rooms were well cared for and well appointed. Breakfast was good with extra touches and all staff members were pleasant and helpful. This will definitely be a stopping place on our travels to the west coast. The price was very fair and reasonable. Thank you for your review. It is always great to hear when a guest leaves our property fully satisfied and impressed! Thank you for making the Best Western Plus Merritt Hotel your hotel of choice, see you again! "Best Help and the Best Western"
We had a car accident on the Coquihalla Highway on our way to Sun Peaks and totaled the car. We were travelling with three 18 year-olds and two small dogs. We needed a place to stay quickly as it was extremely cold outside. We were able to get a suitable room. When we arrived the receptionist was efficient and helpful and even gave our dogs some extra treats as they had no food (it was left behind in the car). The manager and his wife the next morning were so helpful in giving suggestions and offering help. They seemed to be helping a number of people who had also had accidents. The hotel was well located near a Boston Pizza and a Walmart so we were able to get dinner and warmer clothes. All in all we would highly recommend this hotel. Thank you for your review. We hope you are all feeling well after the car accident. The highways in the area can be dangerous during winter storms. Staff and management are always glad to lend a helping hand whenever possible. We hope to see you again under better circumstances. On a snowy, icy night in December. I had family members needing a room for the night. Danica stepped in and got me a room that was pet friendly. She helped me with the terrible road conditions suggesting a route to travel. She was amazing. Thank you for your review. In this instance Danica demonstrated the dedication and hard work our staff put in to provide a great experience everyday. We are glad we could help and will see you next time! Hotel is new. Very nice rooms. Good decor. Nice pool and hot tub. Staff were very good. Breakfast was ok. Could be improved, but more 5han adequate. Only problem was heating system in room. It was a cold day and a couple of the vents blew cold air, not hot. Staff moved us, but the next rooms heating system was marginally better. Thank you for your review. We are glad that your overall experience was positive. However, we always try to go above and beyond guest expectations. We welcome feedback that can help make your next stay more pleasurable. Your input has been noted and will be addressed immediately. An excellent hotel to stay in. The beds are so comfortable, a quiet hotel, very clean, excellent staff, and an amazing breakfast. The best hotel we have ever stayed in. Definitely recommend this hotel to anyone in the Merritt area. Thank you for noticing the breakfast menu. We have been upgrading and changing the menu since opening and received a positive response from our guests. Staff in all departments will continue to make your stay memorable each and every time. See you again! Hotel went above and beyond for our hockey tournament this past weekend. When they heard our Sunday game was at 7am they offered to open the breakfast early so our little athletes could eat before their game. Thank you for the review. Minor hockey is very popular winter sport in our community. We are happy to support the association and accommodate the visiting teams by fulfilling their needs. Hotel was almost full, 3 hockey teams and a Christmas craft fair was on in town. Service was great, they even started full breakfast service at 5:30 am to accommodate our early games. There's a Boston Pizza restaurant next door and even a Walmart 2 mins away, everything you need for a hockey teams stay ! Thank you for the review. The future NHL stars need fuel on the ice so we are glad to open the breakfast early for large groups with enough notice. 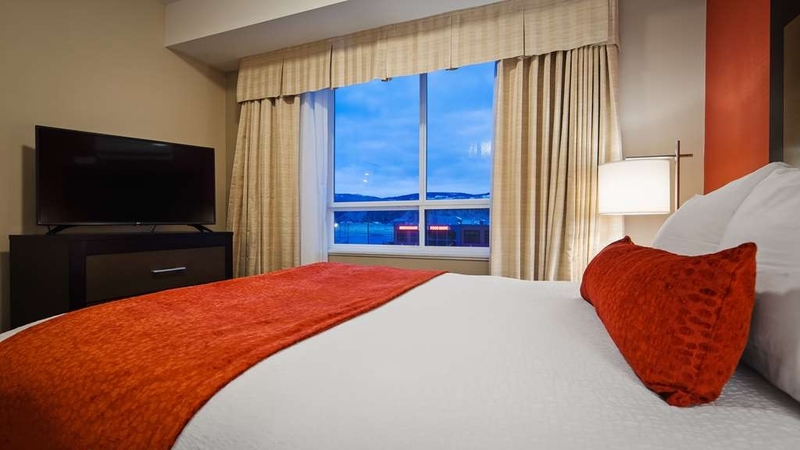 With 83 rooms and food and shopping nearby we are the perfect stop in Merritt. The spacious and wonderful breakfast was a big hit with all of our group, I do believe. A big hit. The hotel is new and therefore very clean. The staff were very accommodating. I would recommend this hotel to everyone. Thanks for the review. Our public areas were designed with large groups in mind. Our experienced staff keep cleanliness at the top of the list and go above and beyond to accommodate the needs to our clients. "One great Hockey weekend made perfect because of the amazingly well done hotel and it's staff. Kids had fun"
Thank you for your review. Being the top of anybodies list is a great achievement and honor! Thank you for choosing us and see you again next season. "Great Service in a New Hotel"
Enjoyed the experience from the moment we entered the doors of the new Hotel. We were greeted by friendly, welcoming staff. Loved the Pet Friendly back door rooms. Modern design with clean services. The rooms were clean and quiet. Never heard the hockey teams players as they were busy in the pool. Very Pleasant stay. Kids loved the Pool. Thank you for your review. We are excited to hear that our staff and property are exceeding guest standards! Yes, we are a pet friendly hotel and have kept that in mind from the planning stages. A peaceful sleep is always available at the Best Western Plus, see you again. Stayed for one night - very comfortable, clean and personable staff. I would definitely recommend this for business or pleasure when in Merritt area or en route through the area. It isn't in the downtown core, but its a 3 minute drive. There is food nearby. Thank you for your review. We appreciate your recommendation and look forward to seeing you on your future stays. We were in Merritt for a hockey tournament and we can't thank the hotel staff enough for making this visit such a great experience! The hotel amenities and staff were amazing, the breakfast each morning was fabulous! Thank you for your patience with our excited and energetic kids. 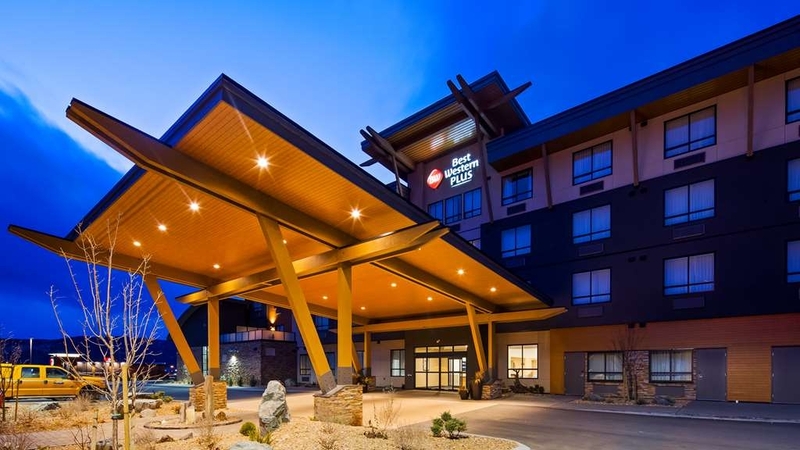 We will definitely spread the word throughout our association that this is the hotel to stay at when visiting Merritt. A great tournament and a great hotel with wonderful staff, thank you!! Thank you for your review. Being the largest property in Merritt we are able to handle groups with ease. Also now that our pool and hot tub are open the kids have somewhere to burn off all of that energy! "Very new, very clean, great staff!" We have stayed her a few times since they opened in August. Enjoyed it each time. Their staff are all super friendly and make us feel welcome. This is a great halfway place to stop going to or from Vancouver. Fine breakfast too. Thank you for your review. Your repeat business is greatly appreciated! Our customer loyalty has been increasing since the day we opened. See you on your next stop through. "Super friendly and professional staff!" This is a newly opened hotel so it was spotless and fresh which is always a bonus but all the staff who saw us were extremely friendly, interested in our needs and very professional. The bed was also perfect, my husband has trouble with beds but he got the best sleep in a very long time. This was such a pleasure because we had a difficult time getting into the area due to weather conditions. We highly recommend staying at this Best Western. Thank you for your review. We have have been receiving rave reviews about the sleep system we offer which includes the bed, pillows and linens. Merritt does provide that safe haven for those weary travelers coming through the mountain passes. We are glad you found us and our staff were able to offer the special iCare hospitality that is only found at Best Westerns. When just stopping somewhere for the night on a road trip my main focus is often just clean and cheap. When I got to the best western plus Merritt I was surprised at the value I got for my money. I was able to check in under a AAA/CAA rate which made the room at the lower end economy price yet this property is not lower and economy. This is the type of hotel that I would look for when wanting a more comfortable leisure extended stay. The property was new or at least newly renovated, decorated a comfortable modern style and spotlessly clean. The check in staff was super professional and friendly and the checkout staff was even better. They were quick and professional yet found a way to make a personal connection. This property was the perfect balm to some road weary travelers. My only complaint and I'm leery to even say complaint as it was really nothing; was that since it was snowing the entranceways got a little bit wet and it was not adequate mats to keep the entranceways (which were tiled and a sleek smooth tile) from getting slippery. They did have wet floor signs up but I would've preferred an extra mat to protect from breaking one's neck. Almost slipped on two occasions but thankfully had hold of my luggage trolly. Overall great stay! Definitely recommend it if you're in the area. Thank you for your review! We are glad you enjoyed our hospitality and product. We have ordered in proper mats for the winter weather. Unfortunately, the snow came in quicker than the delivery of those mats. We are happy to report the mats have arrived and are in place. We will see you next time. Nice new building, good location and friendly staff. Breakfast in the morning is nicely laid out and there is a very nice Coffee machine available 24 hours. Good value for the money, and the points are always nice. My husband and I spent a night in Merritt rather unexpectedly due do a bit of a mishap. The gal at the front desk when we checked in learned I had to leave my car at the rest stop and immediately volunteered to drive my husband up to retrieve it and the owner was kind enough to cover for her. Add that to the fact the Best Western Plus is a beautiful new hotel with extremely comfortable beds and pillows. We enjoyed a great breakfast in their bright and sunny dining room - and met the owner where we able were to thank him for going above and beyond in getting our car back! Will definitely stay here again on any subsequent trips thru the area! Lovely brand new hotel, super clean, very good beds and bedding and more than adequate breakfast. Located close to the highway with easy on and off access and in a town which many people are stopping in purely as a stop along the road on a road trip at this time of year. Would also be a good spot for conferences, bringing together people who live in the smaller surrounding towns. Our team stayed here for a tournament & the hotel took great care of us. The free breakfast was a HUGE benefit for us because we could feed our team every morning all in one place and be ready to go even before we left the hotel. I'd recommend this hotel to anyone staying in Merritt. Two thumbs up !! "Shiny and new, but set your alarm for breakfast"
The Best Western in Merritt is brand new and that means that while everything is clean and modern they are still working out a few glitches. The pool wasn't open yet while we were there but I'm sure that will be remedied very quickly. Two small complaints: breakfast was cut off at 9am when we were there and we actually missed it because we slept later than we expected (very comfy beds). I also don't understand the layout of the room we stayed in. It had one king sized bed and one TV, but the bed did not face the TV. Is it strange to watch TV from your hotel bed? I don't think so. In fact there was really no seating possible in front of the TV, we angled it toward the bed. Not sure what the designer was going for. The new hotel itself is beautiful though and I'm sure you'll enjoy your stay. The breakfast area is the nicest looking one I've ever seen in a Best Western, just wish I could have used it. My wife and I stayed here mid-September, as a stopover on our way back to Vancouver. We were very pleasantly surprised - the room was large and very comfortable, we had our own terrace with chairs and a table overlooking the Town. The Hotel had only been open a couple of weeks, and so the pool was still being completed but once it is, I'm sure it will be great. The staff were friendly and very helpful, with suggestions about where to visit and where to eat. The breakfast was good, with a reasonable variety of choice. A great find and will get even better once the finishing touches are complete. "Don't bother to eat here"
Hotel is new and nice. Food is .... wow, it's airline food. Or hospital fare. Stick it in the mircrowave and reheat. One of our party couldn't even have toast and peanut butter as there wasn't gluten free bread as an option. Yes there is fruit and yogurt. But next time we'll stay somewhere a lot cheaper and just buy a decent breakfast at a restaurant. Thank you for your response. Sorry we were out of Gluten Free toast on your stay. We are looking to add more Gluten Free items to our menu. These items will compliment our hot waffles, fresh cooked sausages, bacon, eggs, fresh fruit, yogurt, granola and cereals. "A pleasant respite In Merritt BC"
Overnight here while wandering through BC. This Best Western hotel is staffed by a very courteous and well spoken crew. The service and amenities are excellent, the rooms clean and comfortable, and the breakfast offerings extensive. Highly recommended. We only stayed one night on our trip from Edmonton to Sidney BC. Being a brand new hotel, it was a most pleasant experience. The room rate was excellent, which included a great breakfast, with sausage and egg cakes, as well as the standard waffles with yogurt or syrup. We will definitely stay there again. The top 4th flr had a great view. "Excellent service fro a large group"
"Great place to stop. We'll be back! " Our visit our visit to the hotel was short.... and the staff was very friendly and welcoming. Every part of this lovely hotel we visited was extremely clean, a great place to stop even with a little baby. Thank you for making us feel welcome. "loads of convenience and comfort"
Stayed the first time at this hotel during it's grand opening week. Room was very clean and spacious as well as energy efficient. Materials used throughout the hotel's design were of good quality and taste. We have been back twice since and will continue to stay during business and trips to Vancouver. overall I was very satisfied during my stay. The staff were great. Friendly and helpful. The room was perfect. Nice layout, very comfy bed and very quiet. Would certainly recommend this hotel to others. Convenient stop overnight on our way from the Rockies to whistler. New hotel so in absolutely pristine condition with comfy beds and great bathroom. Lovely friendly receptionist who recommended restaurants for evening meal. Good breakfast included in the price. Road noise a little annoying but the rooms have good sound proofing. Beautiful facility, great service! Nice handy location to get to from the highway. Pool area was not completed at time of stay but it looked very nice. Breakfast area was very nice but the quality of the breakfast could use some improvement. Stayed one night while visiting family. Very new and very nice hotel with good staff. Tastefully decorated. Breakfast good but hot items not very exciting. Found previous guest's hat behind chair upon check-in. We stayed in this just-open BW Plus. They're off to a good start! Friendly faces and professional manner, room quality, breakfast up to expected standards made our stay here really pleasant. The pool was not yet done, but they had an arrangement to use another local hotel's facilities. Our kids were very happy to find some water after a long day of travel. There is a couple of restaurants and a department store within walking distance, and tons more to find with just a short drive down the road. Recommended! "Finally.......A brand new hotel in Merritt!" Very clean, brand new hotel. The staff are very accommodating and personable. Any little issues we have had are always quickly and pleasantly resolved. The included breakfast adds good value to the stay. Our favourite place to stay at! Clean. Friendly. Very comfortable (especially the bed and pillows). Free breakfast was good, buffet style. We brought our dog and enjoyed having two room doors - one to lobby and one directly out. Not "high-end" (e.g. no room service, only bkfst buffet) but, overall, the value for money was really good and we would recommend this hotel. Honestly, I wouldn't of expected hotel of this quality in Merritt. Not that there's anything wrong with merit, it's just at this hotel would seem more at home in a larger city. It's brand new and very well appointed. The staff is super friendly and treated us very well. I will definitely stop there again as this was a great midway point on A long motorcycle trip. I would highly recommend staying at the Best Western in Merritt. Great staff and service, comfy beds, very clean big rooms, walking distance to Boston Pizza, wonderful breakfast. We recently stayed here with our hockey team and the staff was very pleasant and accomodating. "Best Western, Merritt, B.C., Canada"
Beautiful new hotel. Wonderful staff. Electric car charging station is a great asset. We will definitely stay at this hotel again when we travel to Vancouver. Will highly recommend to friends and family. The room, with king bed, was spacious and clean with a lovely view to the mountain ranges to the east. Front desk staff were friendly and gave good advice about restaurants nearby. Kitchen facilities in the room were surprisingly good (full fridge, two induction cooking plates, full supply of plates and cutlery). "Excellent experience at this brand new Best Western hotel." We were pleasantly surprised when we arrive at the Merritt Hotel when we learned it was only open approx. 2 weeks. It is a beautiful and sparkling clean hotel at a great value. The staff was exceptionally helpful. They researched and reserved an appropriate BW hotel room at our next destination. "New hotel not yet on GPS"
Stayed at Best Western Merritt 7 weeks old. Service, decor and design excellent, Breakfast room very well designed and rooms well appointed. Good location just off Hwy 5. Great alternative to Kamloops. I stayed in an accessible room at this new hotel. The shower hear was installed high up and there was no way to adjust the shower setting or angle for someone who is in a wheelchair. I liked that the room had a large balcony. The accessible room was nice and spacious. The hotel also has 7 plug ins for electric cars. Beds are very comfortable. I had asked for extra pillows when I checked in online but that request did not get filled. "A new hotel is a wonderful thing"
Brand new property so everything is perfect from the rooms to the common area's. Nice fitness room with two very large TV screens. The breakfast area seats plenty and the food selection was up to standard. The business room has a nice desk with good lighting and plenty of power plugs. A large room with a wonderful full size deck attached was a plus. Enjoyed sitting outside watching the sun go down. As close to 5 star as it gets in a town like Merritt. I normally stop in Kamloops, but never again. The staff made us feel like they were there to serve only us. We had one of the balcony rooms, which at the end of a long drive was heavenly. Management went out of their way to exceed all our expectations. 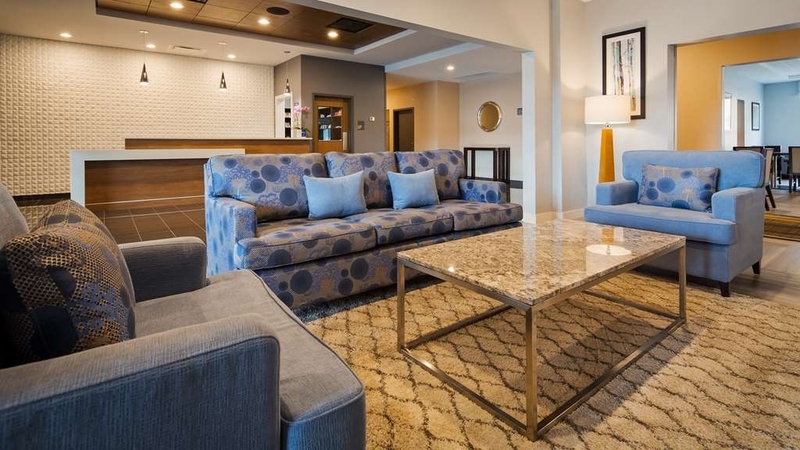 The Best Western Plus Merritt Hotel is brand new and pretty spiffy. Everything is about as one would expect for a new Best Western Plus, with nice clean and quiet rooms and an excellent free breakfast. A nice feature that, to us, is a rarity, was a small freezer in our room's refrigerator. This is a nice touch that could be very valuable in certain circumstances. The staff here was very good, particularly Danica who has a wealth of interesting knowledge about the area's surprisingly lurid past. (Those of us from the US tend to think of British Columbia as being all flannel shirts and suspenders and axes. This is mostly not the case, for the history (and appearance) of Merritt, for example, is a lot more like the Wild West than lumberjacks and redwoods--a very cool place.) Anyway, I strongly recommend the BWPMH--I doubt that there can be a nicer place to stay in Merritt. Best hotel in Merritt, very clean, excellent staff, bed was awesome. Definitely would stay again. Close to lots of amenities. Staff are very friendly and accommodating, lots of easy parking for all vehicles including plugins for electric vehicles. Breakfast included. Thank you for your amazing review! Our excellent staff and spacious property look forward to hosting you again. "New hotel in Merritt. Near perfect for the price!" Incredible value for the type of accommodation. Staff were nice and cheerful. Breakfast was good and area kept clean. Rooms were still new and very clean. If you happen to be considering this because you own a Tesla, it's an excellent place to stay. Chargers are new and plentiful. Car easily hit 118kW as it was near empty from the ride back from Revelstoke. (I moved the car to regular parking as it was fully charged in under an hour.) Great experience! Highly recommended even if you don't need the chargers. Thank you for your review. Being about 300kms from the lower mainland our property provides an ideal stopover and charge up for all Tesla drivers. See you again on your next road trip! "Would not stay here until fully finished"
Thank you for your response. This gives us a great opportunity to better our service for any future stays. A review of response times and policy regarding coffee and hot water service will be completed. You will be glad to hear our fresh one cup machine is being installed next week which will provide a freshly brewed cup whenever a guest requires. Our breakfast carries a wide variety of items hot and cold but we are always open to new suggestions. Pool and hot tub will be opening soon and we hope to see you again. "Brand new and just lovely"
This hotel is off the chart! Brand new property, so it is clean! Beds were comfortable, wifi worked great, and breakfast was excellent. Pool wasn't up and running at time of stay. Staff were great. A wonderful experience. And a heck of a deal too! Thank you for taking time and writing us this great review! We have received a tremendous amount of compliments on our beds and bedding. So glad we could provide you with a positive experience to remember. This is a brand-new hotel, with well-designed rooms and lovely staff. We got a fantastic introductory rate, perhaps because the facility isn't totally finished yet (pool, hot tub). The laundry room was an unexpectd bonus after a week of travelling. Danica, who checked us in and worked the front desk the night we arrived was especially welcoming, friendly and helpful. The beautiful, big breakfast room was a lovely place to get ready for the day ahead. If you are looking for a spot to stay on the drive from Vancouver to points east (or heading to Vancouver from the east, as we were), this is the spot for you! "Brand New BW in Merritt"
We stayed 4 nights at this new hotel in Merritt BC. Our kitchenett was surprisingly large with a full fridge, microwave, 2 burner cooktop and dishes. The bed was very comfortable. Being new there was a couple of glitches, such as an outlet being wallpapered over and the TV needing to be set up. Snoop immediately fixed our TV and as the outlet didn't impact our stay, he was arranging to have it addressed by an electrician after we left. Also because it has just opened, the pool and fitness centre were not ready yet, probably why we had such a good rate for a premium room. Other than the pool not being open, the only other comment on the negative side was the breakfast selection was not as varied as I have had at other Best Westerns, but still good. I would stay here again. We stayed at this Best Western Plus on Sunday August 27. Hotel lobby was open & spacious. Staff very welcoming. Our room had a balcony. The room decor was pleasant. Fitness room was clean & very adequate. Complimentary breakfast was very good, hot & cold selections. We really enjoyed our stay at this brand new hotel. Despite the fact it was barely 1 month open, there were no wrinkles and the service was excellent. Rooms are beautiful, as is the whole property. A very nice open breakfast area with nice furniture and TV's and a good breakfast selection. I would definitely recommend this hotel. It must be the best place to stay in Merrit, hands down. The hotel room had everything. The room was so very well thought out and had all features which make a stay comfortable and was well priced. Love the fridge/freezer, microwave, hair dryer, large TV screen, furniture. Brand new hotel. Rates as good or better than other (much older) properties in town. Good breakfast included. Fast reliable internet and good TV selection.Swimming pool was not complete at the time when I stayed there, but will be great when complete in the next few weeks. The hotel has a small snack shop next to reception. Since Merritt is now upgraded to Fiber Optic lines we chose to take advantage. 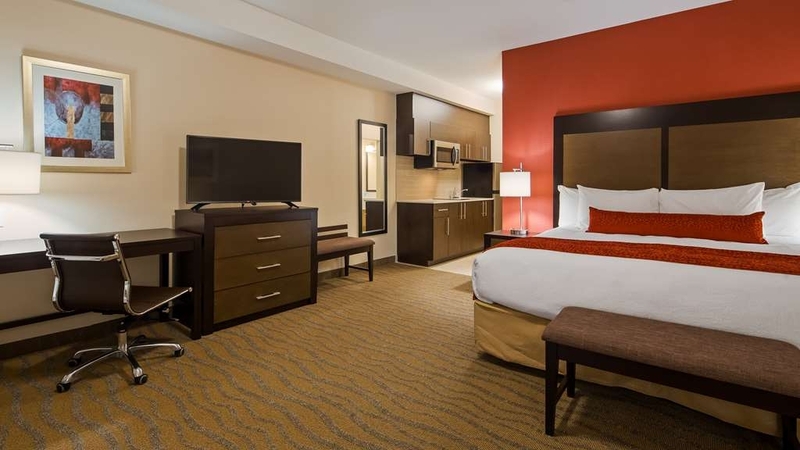 Best Western Plus Merritt Hotel is the only accommodation provider to offer full fiber optic services resulting in the the fastest internet and a great channel selection including pay per view. Thanks for the input and look forward to your next visit! We had a great experience staying at this hotel. The pool was not yet open because the hotel was so new, however arrangements had been made to use the pool at a nearby hotel, which I thought was considerate. Very comfy beds, and a quiet atmosphere. We would stay there again. Great experiences are what Best Westerns are known for. Glad we could arrange something acceptable. Our pool will open soon, see you next time! New Hotel. Clean Rooms. Located outside Merritt City - good idea. Nice , open Breakfast area. Gym had free weights with Aerobic Equipment and Exercise Ball and Mats. Front Reception Staff was awesome upon arrival. Very professional, efficient and helpful lady! Great to hear you enjoyed the facilities. Our great staff will be here to greet you on your next visit! "Brand New only 3wks old"
Pool isn't open yet but the entire building is new and clean. Great price for the value. Close to gas station and Walmart....stayed in a king room was very spacious and comfy. Nice big tv and first time seeing a freezer on the bar fridge. After a long day on the road from Edmonton I was please to discover the new BW plus on Merritt. Only open for two weeks it was exceptionally clean and very well decorated. The lady at the desk was very friendly & helpful and most accommodating. Check-in & check-out were effortless. Breakfast In the morning was all anyone could ask for and room was spotless. Immediate across the street is a new Boston Pizza. Will have no trouble recommending the hotel to other and will definitely stay there again. With ease of access and an abundance of parking, our location is a huge bonus for the weary traveler. I'm glad we were able to provide you with an exceptional service. Our employees are a great asset from front desk to housekeeping. See you on your next trip through! Excellent staff and stay. Great value for a new hotel. General Manager was outstanding with his continuous care to make sure that our stay was more than we ever expected. The included breakfast every morning was awesome and just added that final touch for a wonderful stay. We'll for sure be staying again on our travels and be highly recommending you to others. 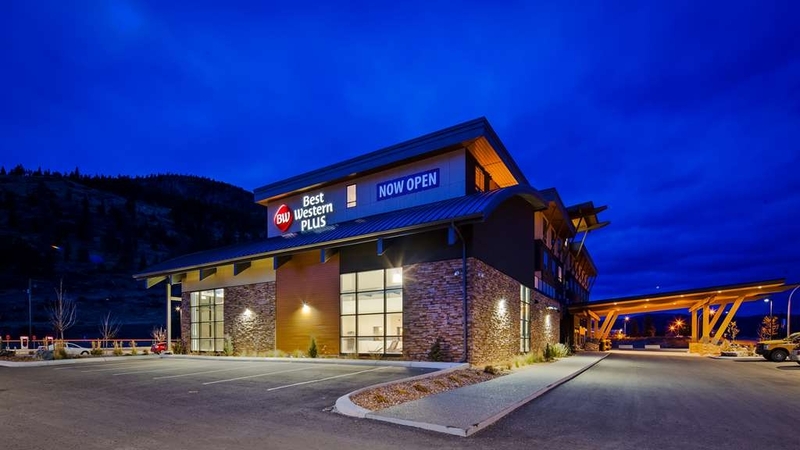 Great to hear the Best Western Plus Merritt Hotel has become your "property of choice" when visiting the Nicola Valley. Recommendations are always appreciated and we look forward to seeing you again! in overall all were excellent and that is why i did book the room again in couple days, thank you. i do recommended to visit it if there is change for me to visit it i will do it definitely. close to hotel is bus station, pizza place and large store in case of to refill and get a dinner. Thank you for repeat business! We are located in a very visible, easy to access location which has a restaurant adjacent and shopping nearby. With mountain views and large decks for relaxation the Best Western Plus Merritt Hotel provides a great nights stay each and every time. "Wonderful new hotel, with even better staff!" A beautiful new family owned and operated hotel. Even without a reservation on a long weekend, the staff offered a better rate than quoted. Very friendly and helpful staff who went over and above. Comfortable and quiet. Thrilled to hear you had a memorable experience at our property! Our goal is to provide a great stay in every aspect; price point being one of them. We will continue working hard to provide unsurpassed customer service for all of your future stays. Thank you! "Brand new, well located, and super clean. Recommended. Great value." We had been looking at this hotel as we went by during the summer. When we visited in early August, it had been open just six days. We were impressed. The rooms are spacious, the decor is fine, and the staff, right from the general manager to all the rest were very friendly, courteous and proud of their new hotel. The breakfast was really good, as is their breakfast room. We chose this hotel to break up our trip to Vancouver. I highly recommend it. Thank you for your stay and recommendation! We did have a delay during construction but are excited to be accommodating guests now. Our hard working staff will continue to provide top notch service so each return stay continues to better than the previous. To accompany our great breakfast program our pool will be opening up soon to satisfy all guest needs. This is a beautiful new hotel, easily accessed off the main highway. We stayed twice on our recent trip to BC from Saskatchewan. The rooms are beautiful, the beds are the most comfortable I've slept in. It's very quiet, and I'm a light sleeper. The rooms come with a great little fridge with separate freezer and a microwave. The breakfast area is huge compared to every other BW I've stayed in. There's waffles, eggs, sausage, bacon, breakfast burritos, fresh fruit, yogurt, cereal and assorted breads and pastries. The staff is top notch! Gurpreet and Anoop are excellent at this family run hotel. My husband forgot something in our room and Gurpreet took care of it immediately. There's lots of room for parking as well as a charging station for your electric car. There's a Wal-Mart nearby as well as a Superstore. This is a truly excellent hotel!!! Thank very much!! Our goal was to cover all bases from the conception to completion of this property. It looks like we may have achieved this! In the short period of time that we have been open, we have already created relationships with many repeat guests. We will continue to do this as we progress. Breakfast will be constantly evolving at the property, since it such a key amenity for our guests. Thank you for staying with us! We do understand that the absence of a pool and hot tub at the moment is causing inconveniences for some of our guests. We are currently working hard with our contractors to have the pool area completed as soon as possible. Our website will be updated immediately when we have all work completed. We are glad to hear the rest of the property fulfilled your needs and that we will be your choice of accommodations in the future! "Excellent new hotel with very helpful staff"
We had an issue with another hotel in the neighborhood and so we needed to find a alternative to stay. We contacted BW+ in Merrit and there was still a room to stay for 2 nights. When we arrived the manager was very helpful to solve our problems and offered to find interesting activities in town. He personally contacted the shop where we could rent mountainbikes. We also got hint to go for a swim at the nearby lake. With his help we had a very pleasant stay in this nice place. The hotel is brand-new and the personnel is very helpful. The breakfast is very good. Thanks a lot. Glad to be of service! Our role in the hotel industry is not only to provide you with accommodations but it is to keep you interested and occupied during your visit. We are more than happy to work with our partners in the community make your visit as pleasant as possible. Look forward to seeing you again!